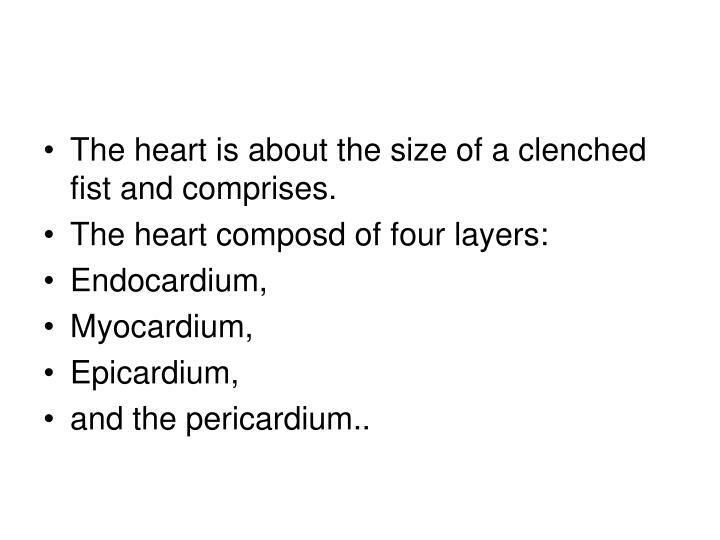 The heart is about the size of a clenched fist and comprises. 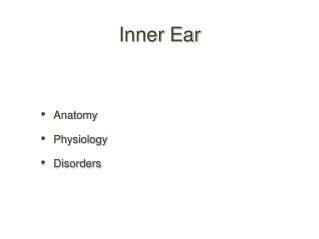 endocardium is the inner layer and is consists of endothelial tissue that lines the inner surface of the heart and the cardiac valves. 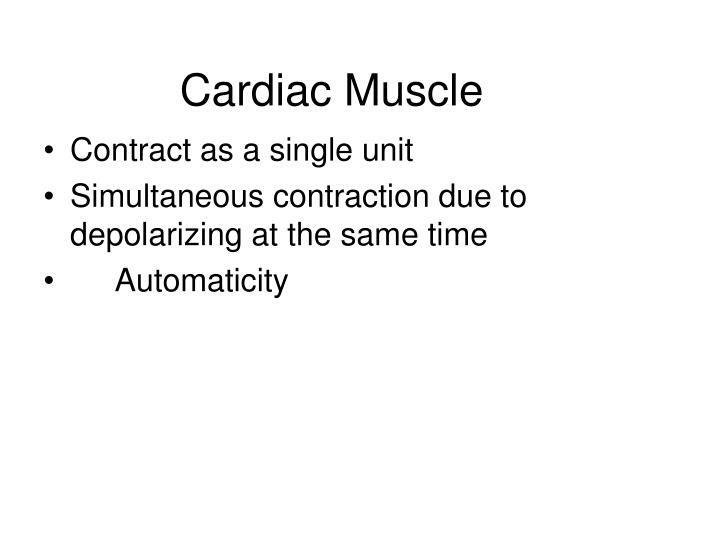 The myocardiumis the middle layer and is composed of muscle fibers that enable the heart to pump. 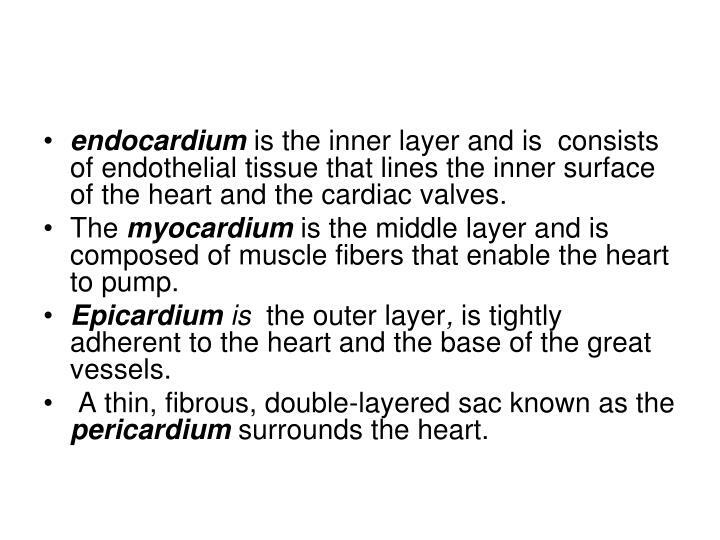 Epicardium is the outer layer, is tightly adherent to the heart and the base of the great vessels. 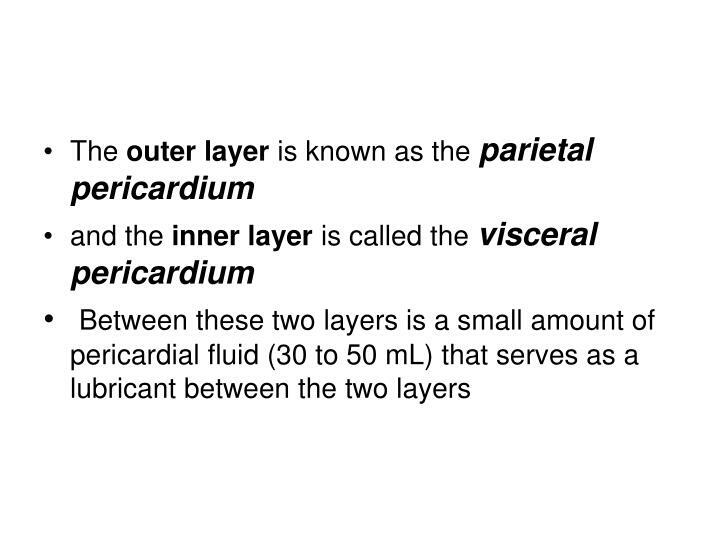 A thin, fibrous, double-layered sac known as the pericardiumsurrounds the heart. 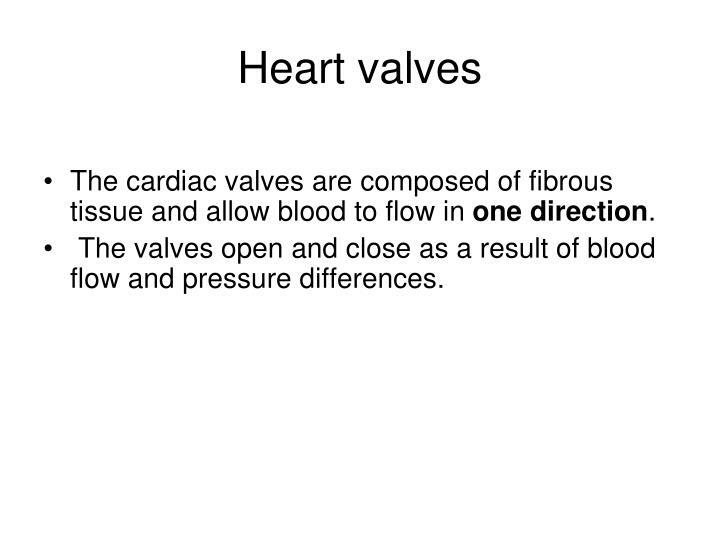 The cardiac valves are composed of fibrous tissue and allow blood to flow in one direction. 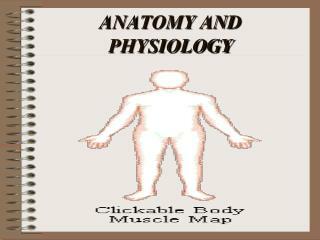 The valves open and close as a result of blood flow and pressure differences. 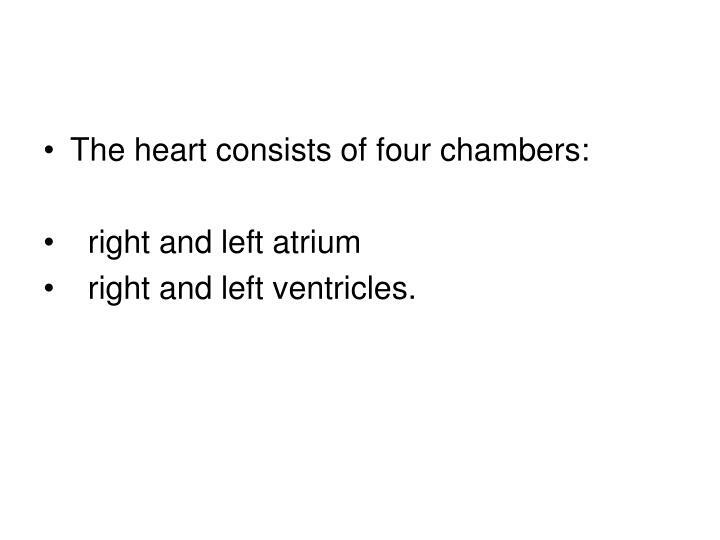 The tricuspid and mitral valves are known as the atrioventricular (AV) valves because they are located between the atria and the ventricles. 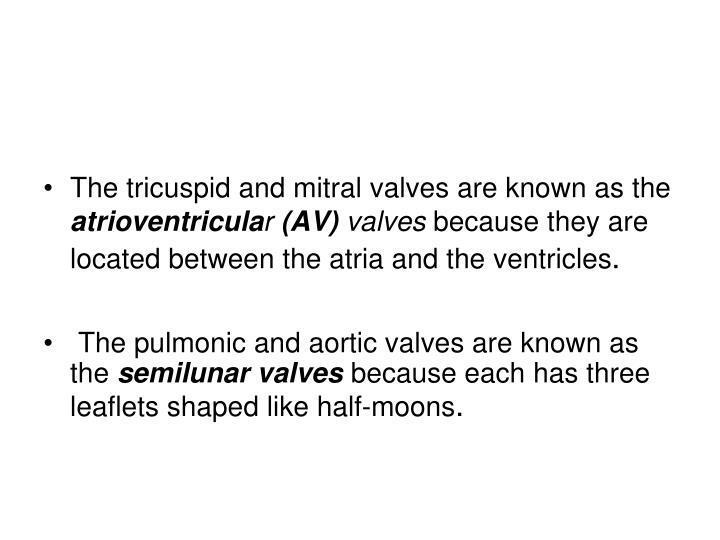 The pulmonic and aortic valves are known as the semilunar valvesbecause each has three leaflets shaped like half-moons. 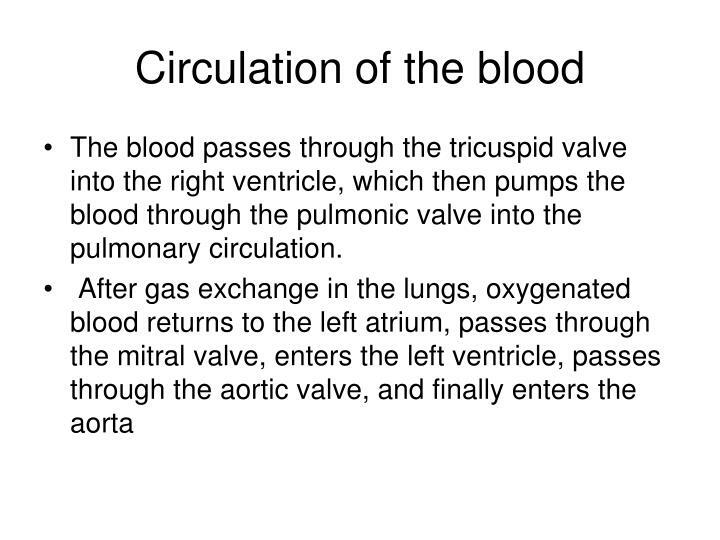 The blood passes through the tricuspid valve into the right ventricle, which then pumps the blood through the pulmonic valve into the pulmonary circulation. 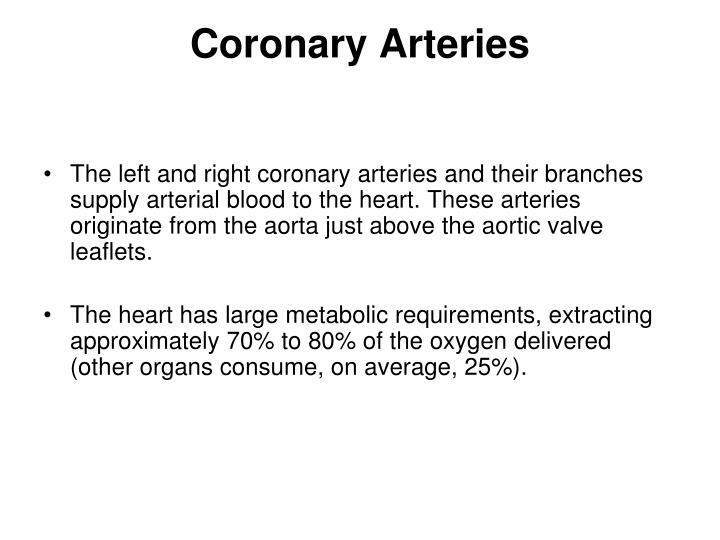 The left and right coronary arteries and their branches supply arterial blood to the heart. 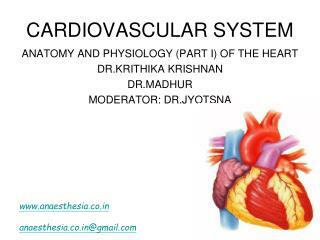 These arteries originate from the aorta just above the aortic valve leaflets. 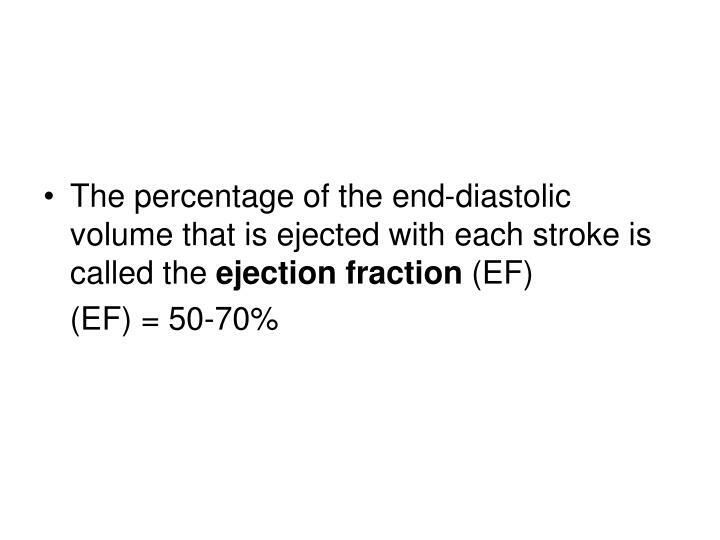 The heart has large metabolic requirements, extracting approximately 70% to 80% of the oxygen delivered (other organs consume, on average, 25%). 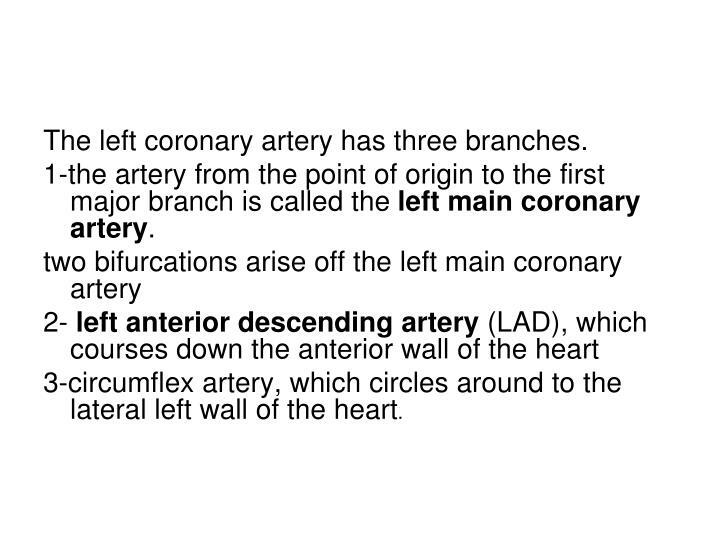 The left coronary artery has three branches. 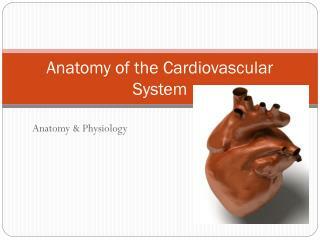 1-the artery from the point of origin to the first major branch is called the left main coronary artery. 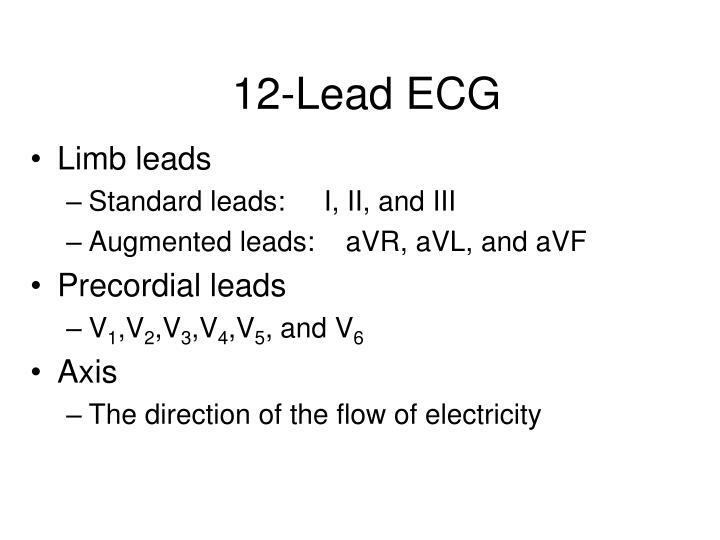 3-circumflex artery, which circles around to the lateral left wall of the heart. 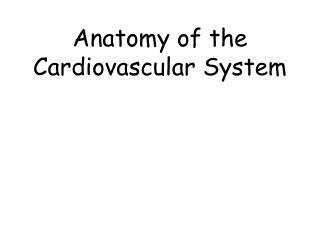 The right side of the heart is supplied by the right coronary artery, which progresses around to the bottom or inferior wall of the heart. 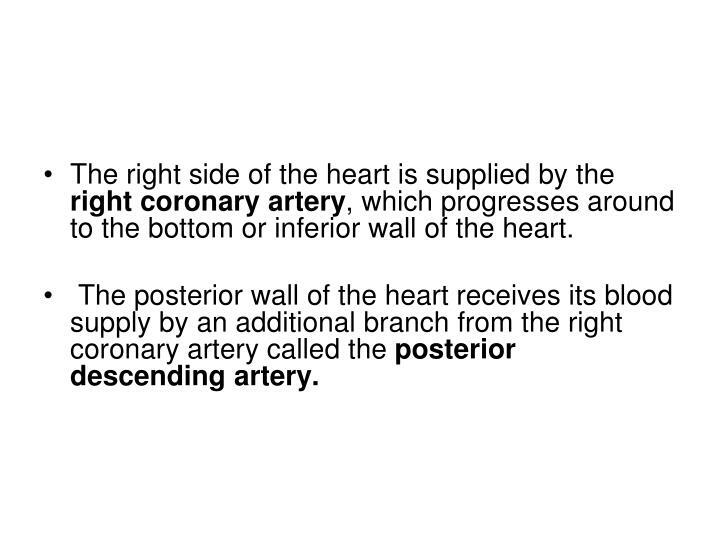 The posterior wall of the heart receives its blood supply by an additional branch from the right coronary artery called the posterior descending artery. 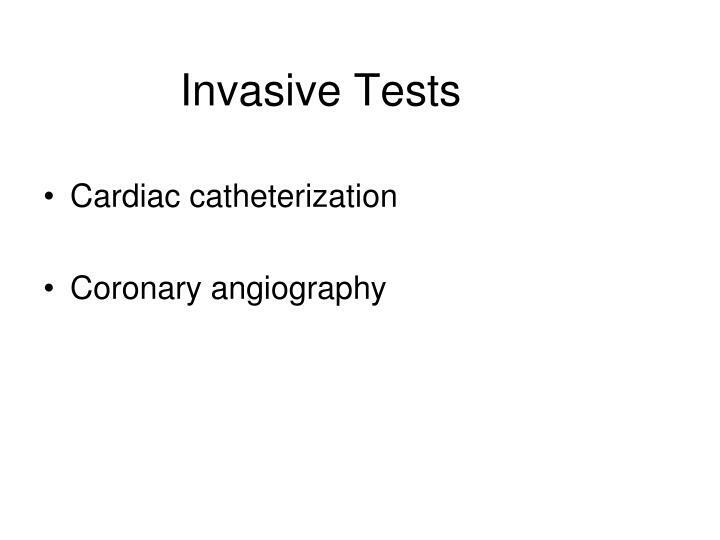 The coronary arteries are perfused during diastole. 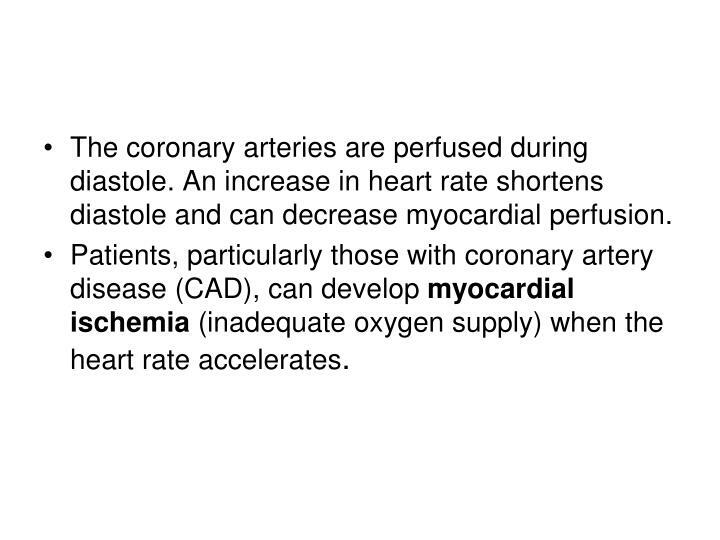 An increase in heart rate shortens diastole and can decrease myocardial perfusion. 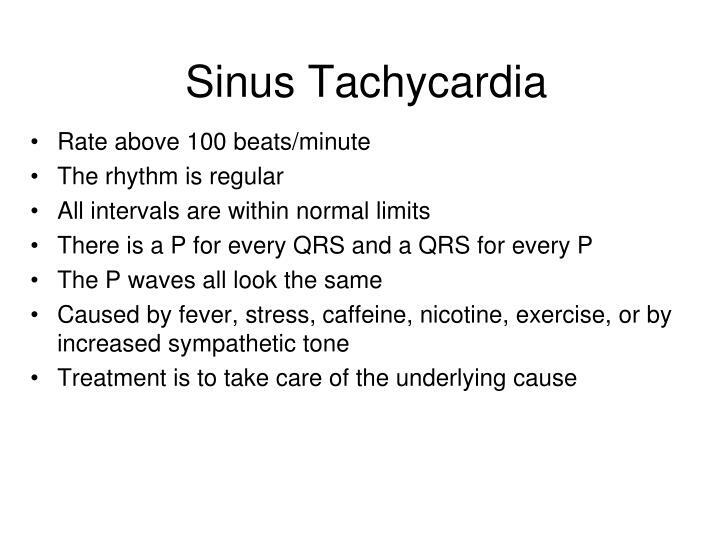 Patients, particularly those with coronary artery disease (CAD), can develop myocardial ischemia (inadequate oxygen supply) when the heart rate accelerates. 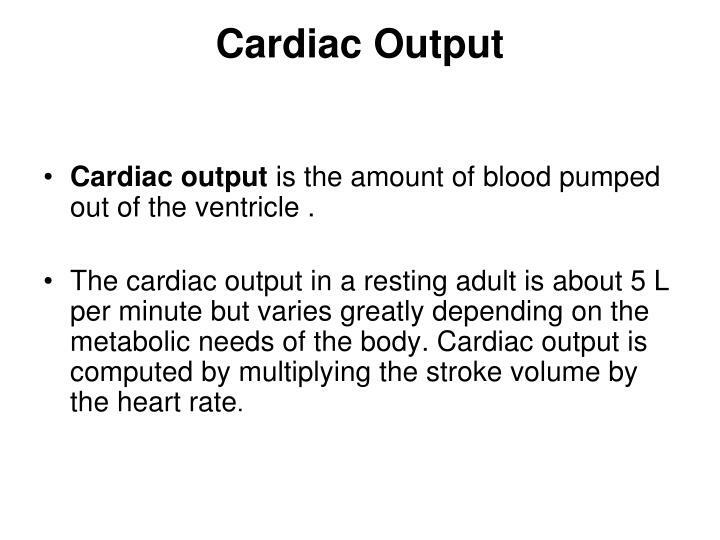 Cardiac output is the amount of blood pumped out of the ventricle . 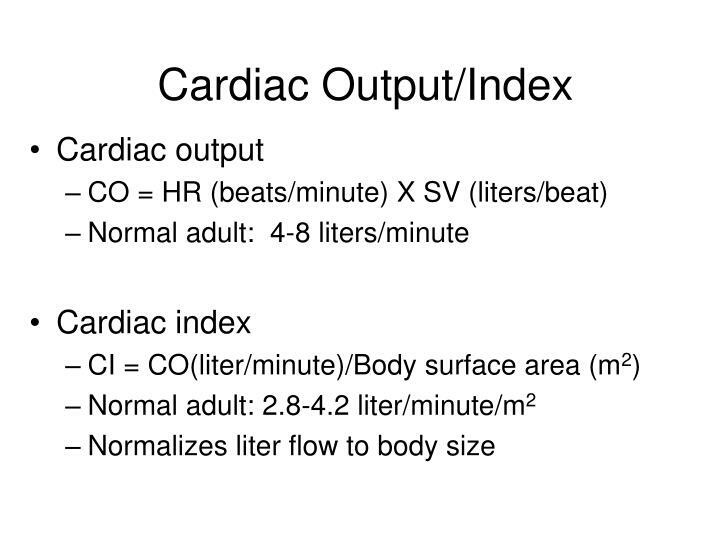 The cardiac output in a resting adult is about 5 L per minute but varies greatly depending on the metabolic needs of the body. 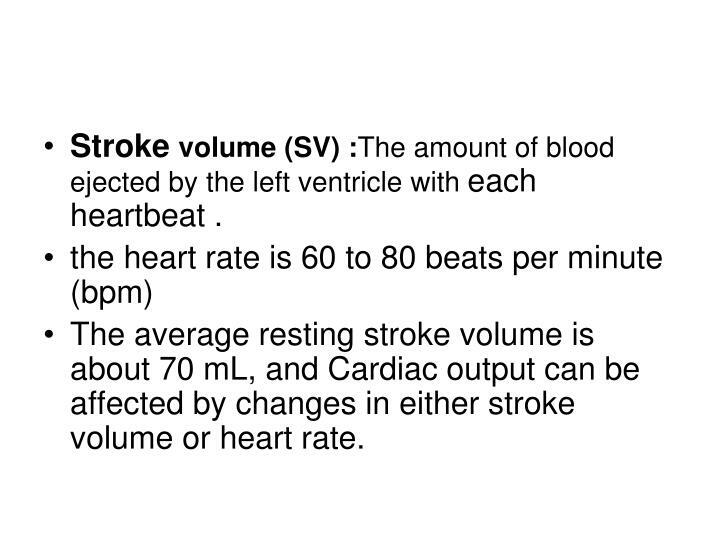 Cardiac output is computed by multiplying the stroke volume by the heart rate. 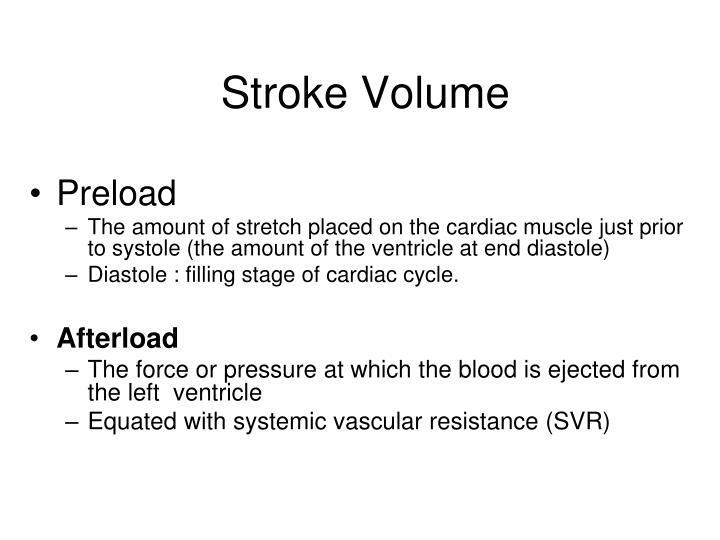 Stroke volume (SV) :The amount of blood ejected by the left ventricle with each heartbeat . 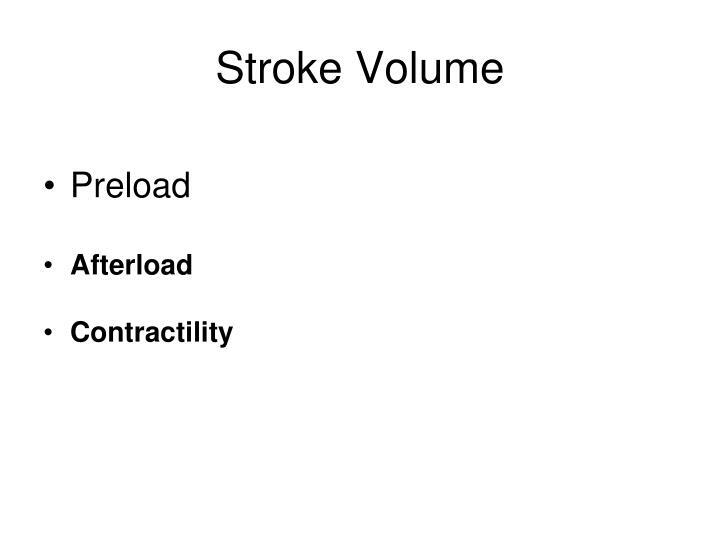 The average resting stroke volume is about 70 mL, and Cardiac output can be affected by changes in either stroke volume or heart rate. 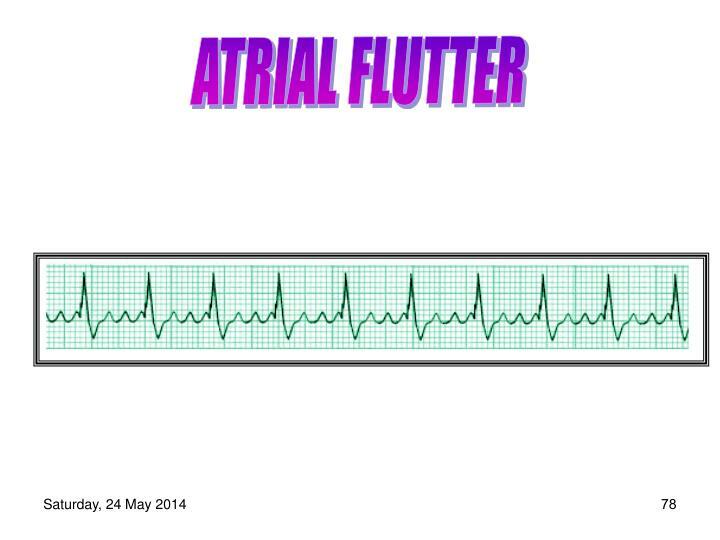 Diastole : filling stage of cardiac cycle. 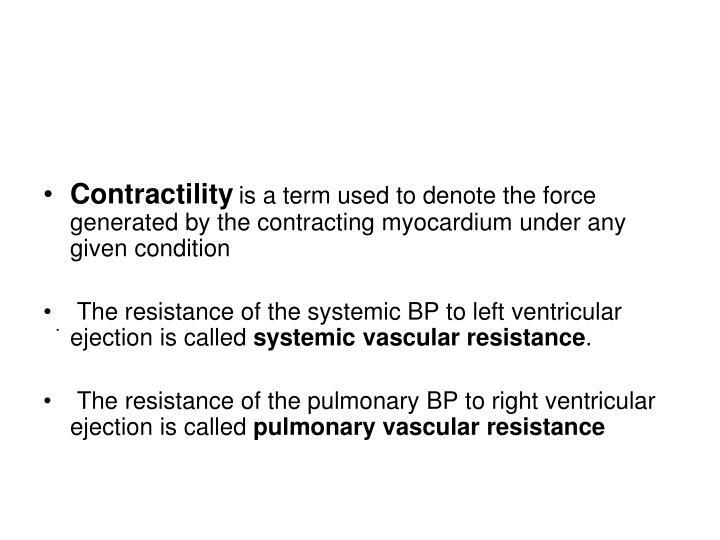 The resistance of the systemic BP to left ventricular ejection is called systemic vascular resistance. 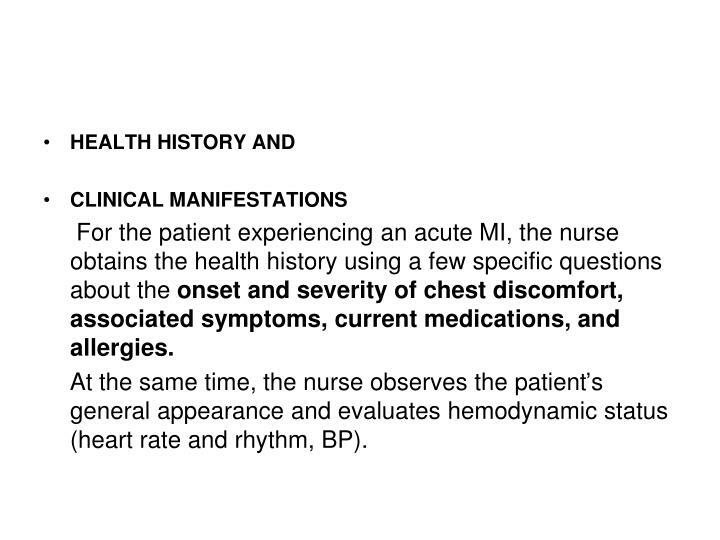 For the patient experiencing an acute MI, the nurse obtains the health history using a few specific questions about the onset and severity of chest discomfort, associated symptoms, current medications, and allergies. 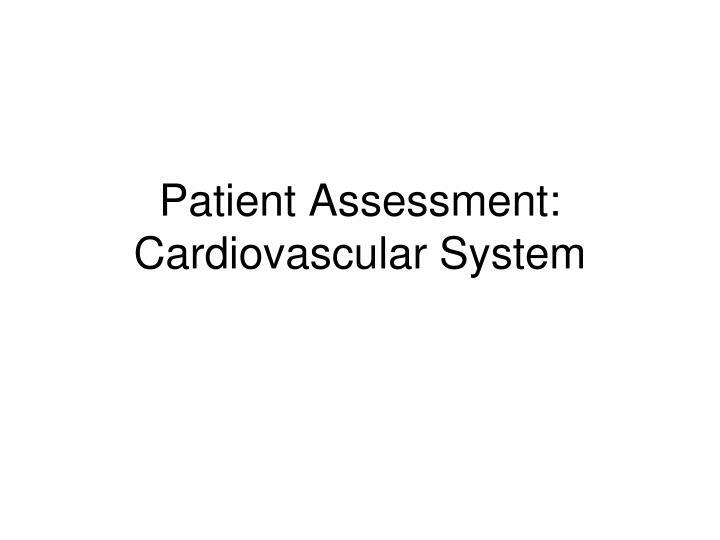 At the same time, the nurse observes the patient’s general appearance and evaluates hemodynamic status (heart rate and rhythm, BP). time between S2 and S1 (diastole). 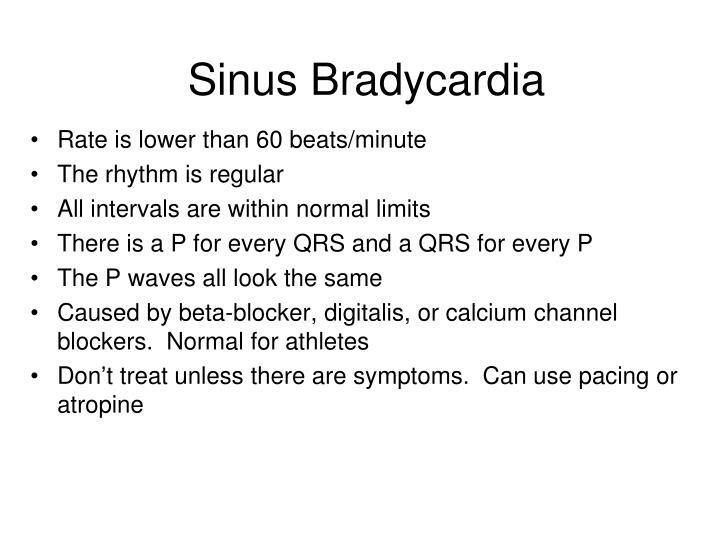 As the heart rate increases diastole shortens. 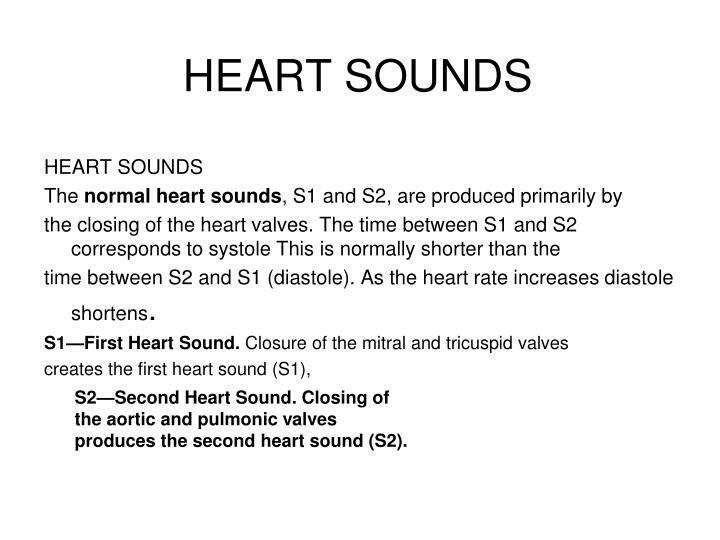 S2—Second Heart Sound. 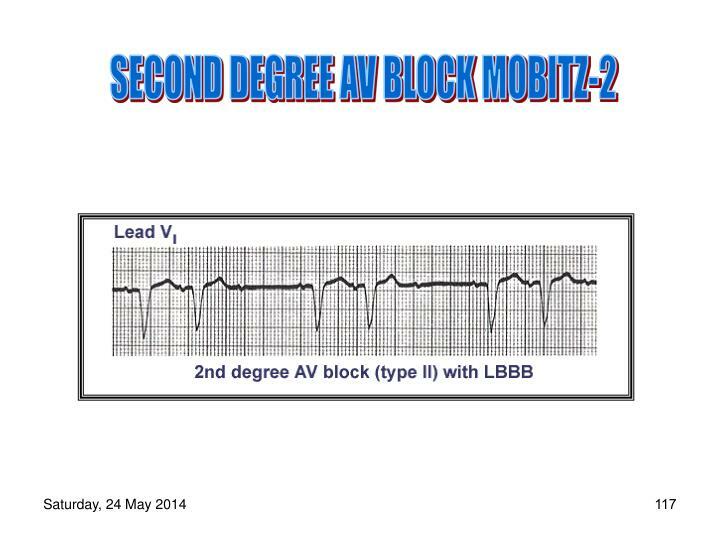 Closing of the aortic and pulmonic valves produces the second heart sound (S2). 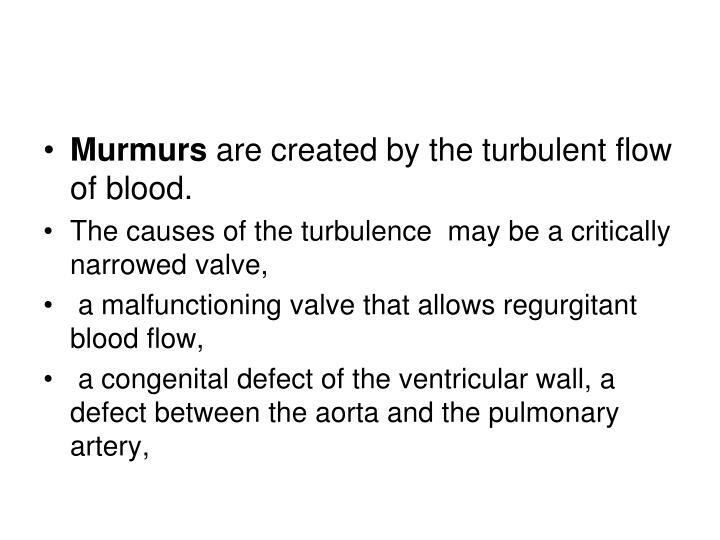 Murmurs are created by the turbulent flow of blood. 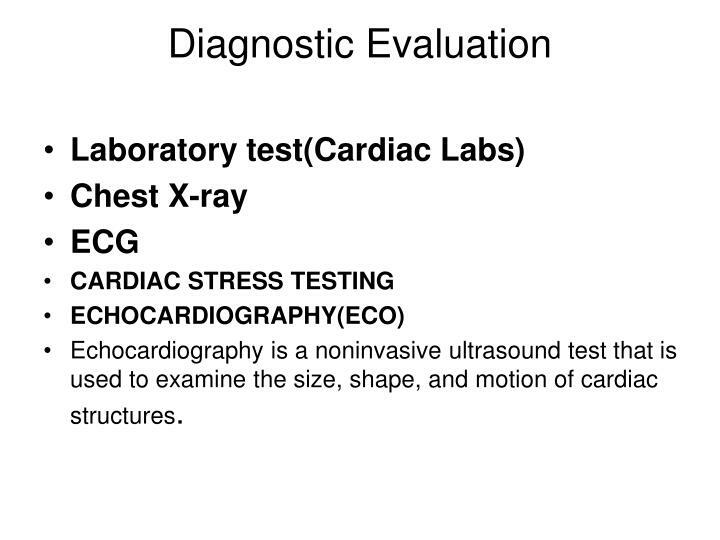 Echocardiography is a noninvasive ultrasound test that is used to examine the size, shape, and motion of cardiac structures. 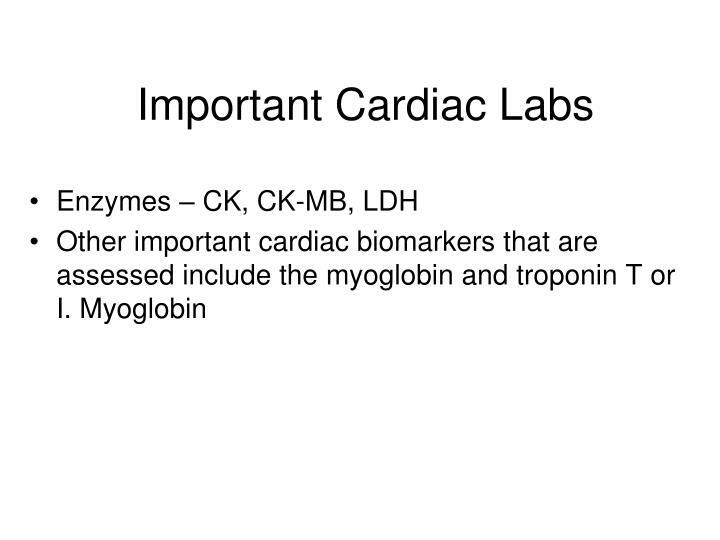 early marker of MI, is a heme protein with a small molecular weight. 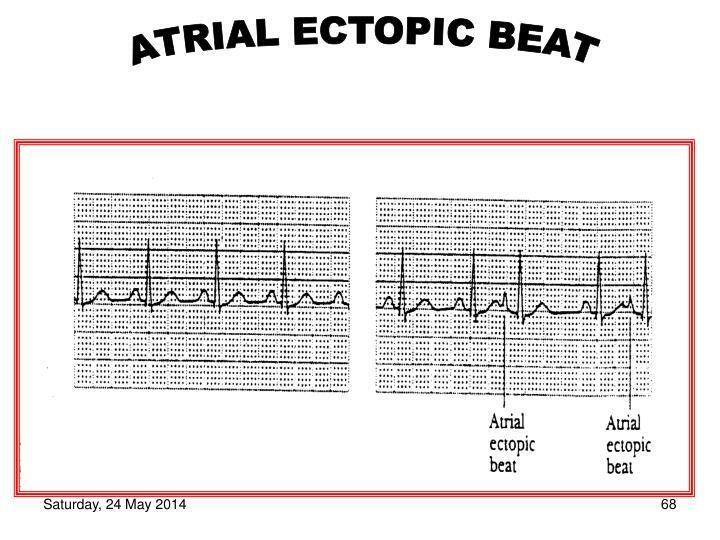 This allows it to be rapidly released from damaged myocardial tissue and accounts for its early increase, within 1 to 3 hours after the onset of an acute MI. 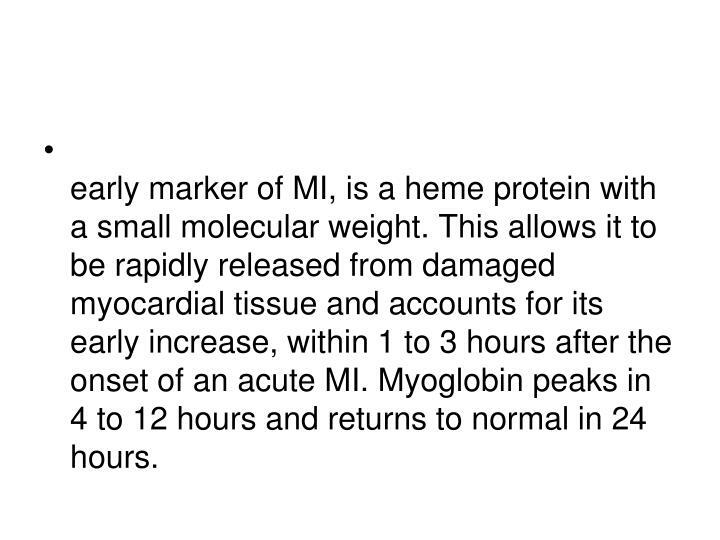 Myoglobin peaks in 4 to 12 hours and returns to normal in 24 hours. 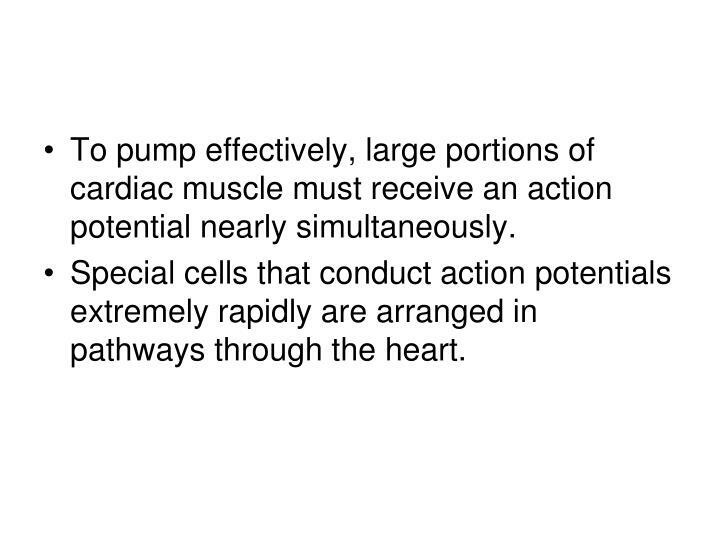 To pump effectively, large portions of cardiac muscle must receive an action potential nearly simultaneously. 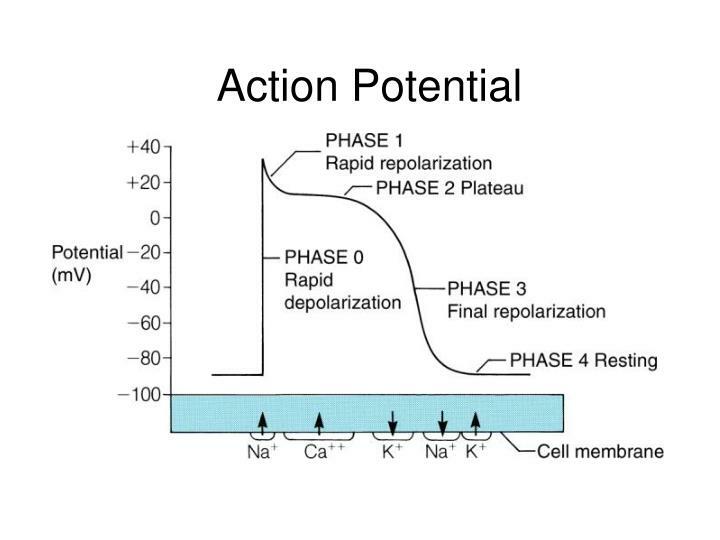 Special cells that conduct action potentials extremely rapidly are arranged in pathways through the heart. 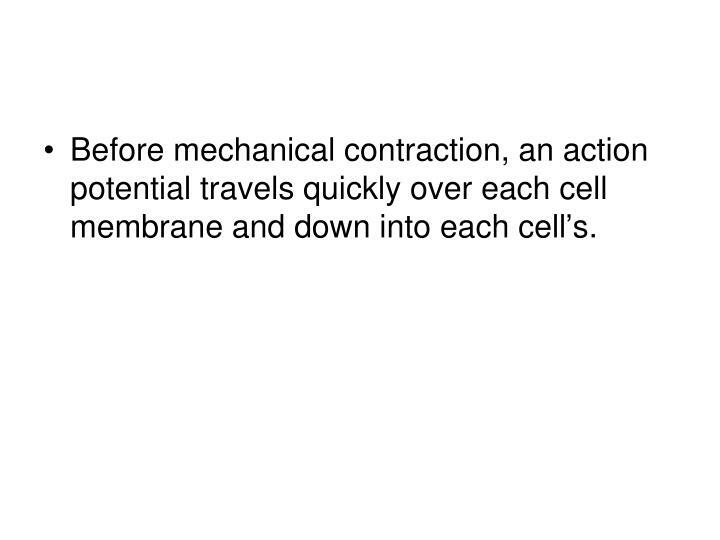 Before mechanical contraction, an action potential travels quickly over each cell membrane and down into each cell’s. 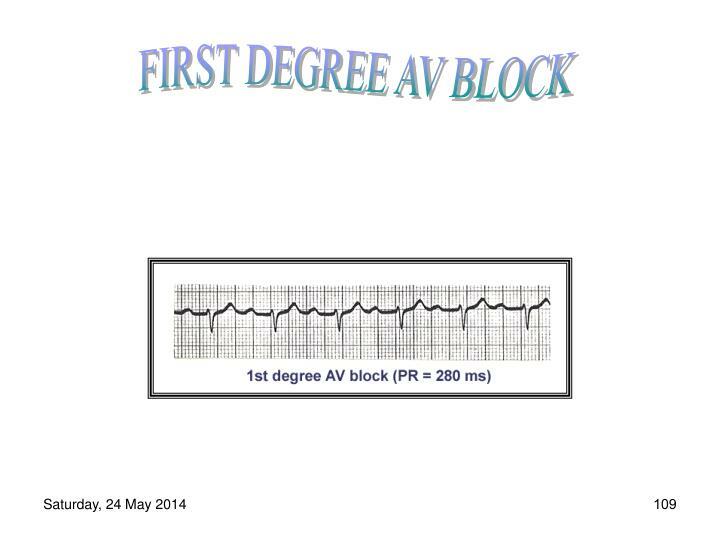 up to 0.12 second in duration . What is the rate? 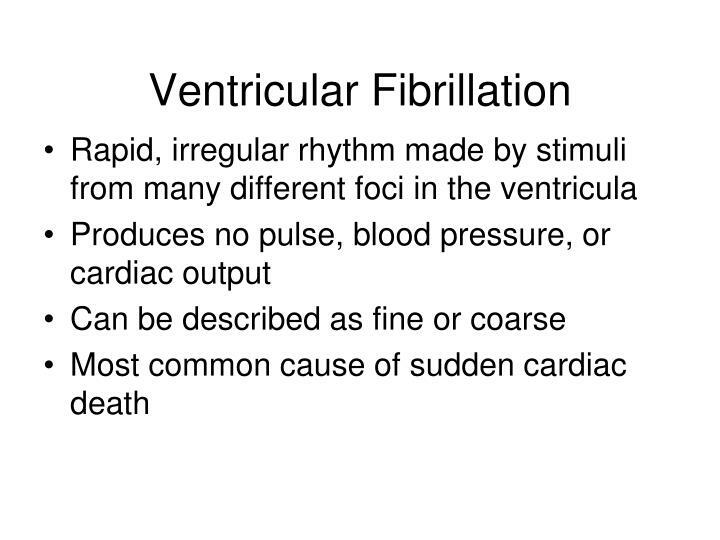 Both atrial and ventricular if they are not the same. 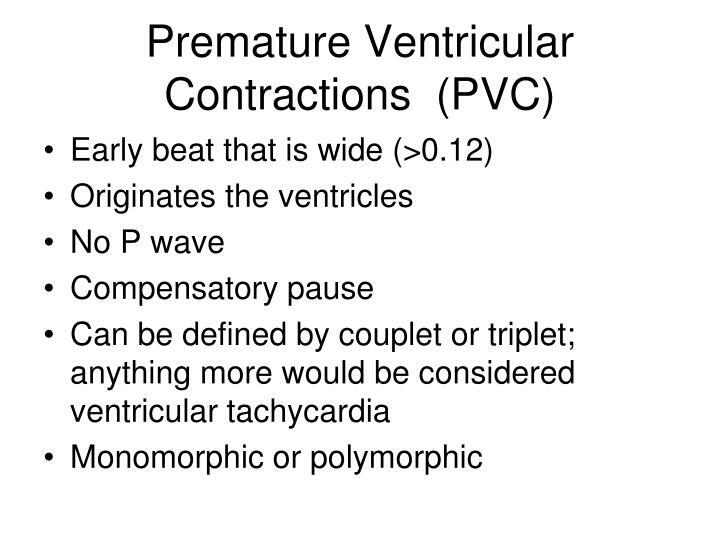 Do the P waves all look the same? 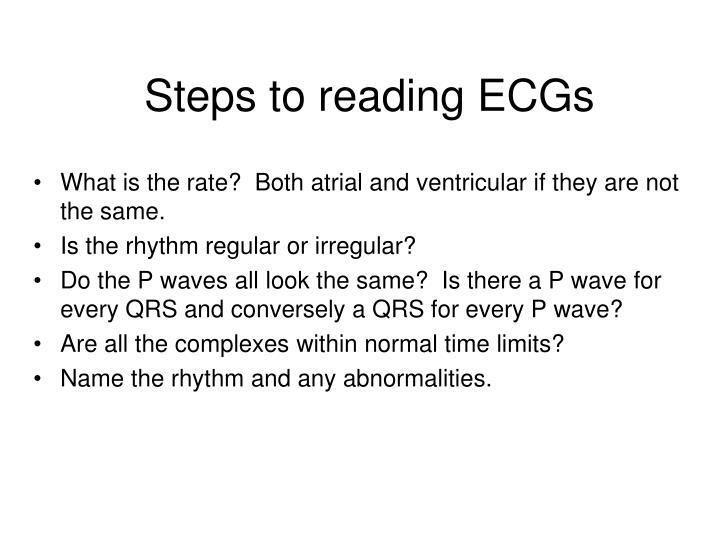 Is there a P wave for every QRS and conversely a QRS for every P wave? 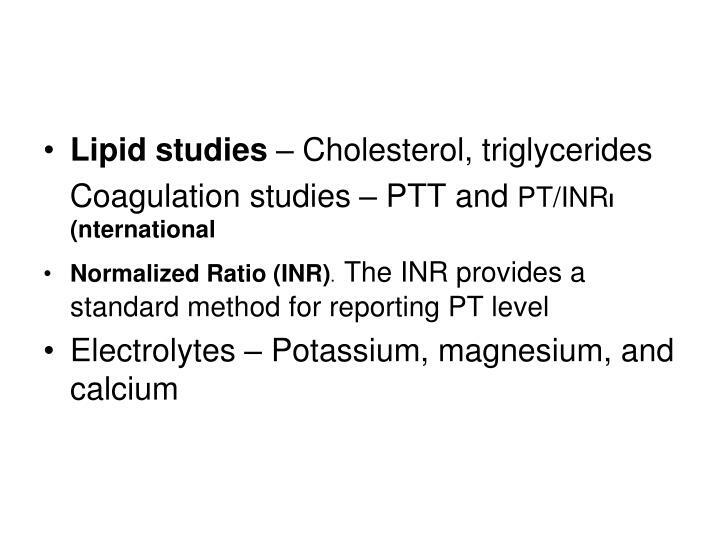 Are all the complexes within normal time limits? 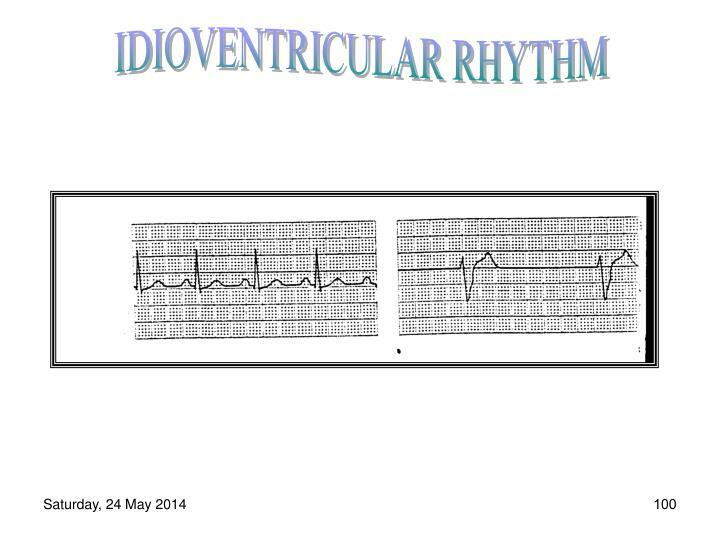 Name the rhythm and any abnormalities. 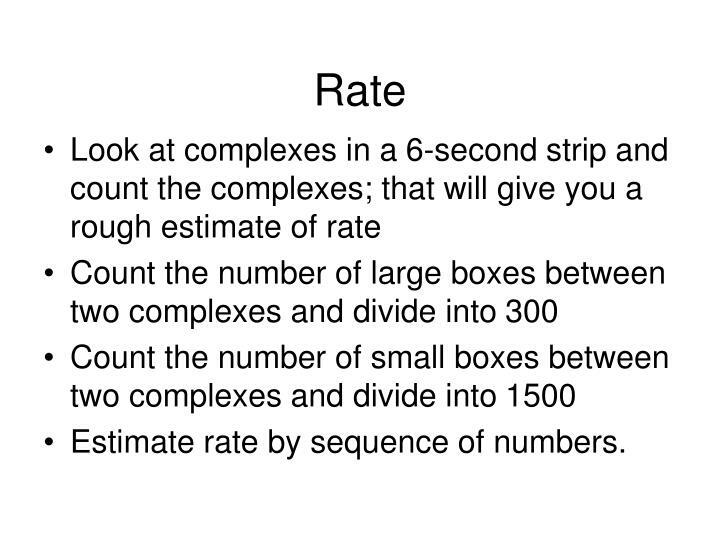 Estimate rate by sequence of numbers. 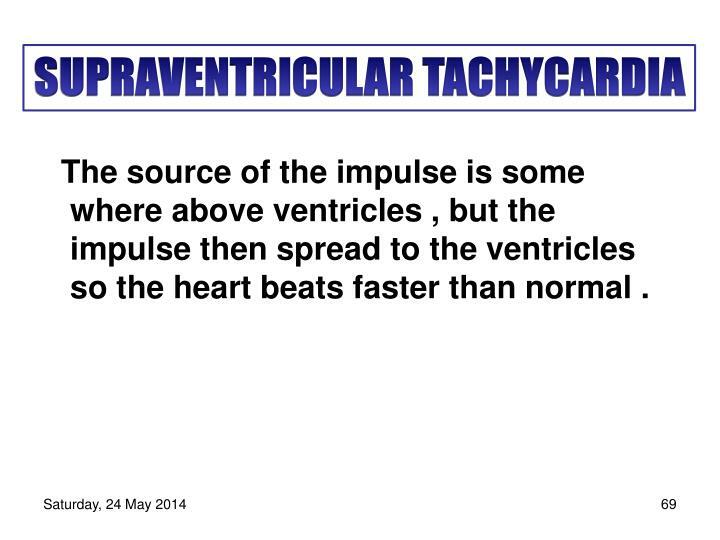 The source of the impulse is some where above ventricles , but the impulse then spread to the ventricles so the heart beats faster than normal . 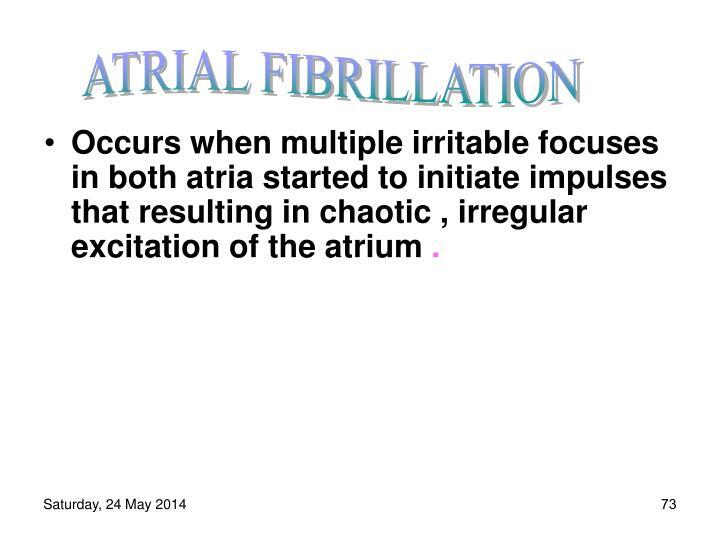 Occurs when multiple irritable focuses in both atria started to initiate impulses that resulting in chaotic , irregular excitation of the atrium . 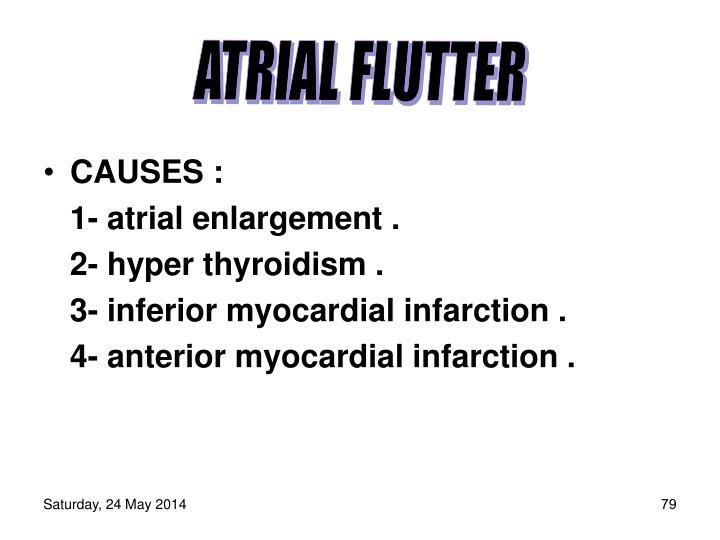 1- anterior myocardial infarction . 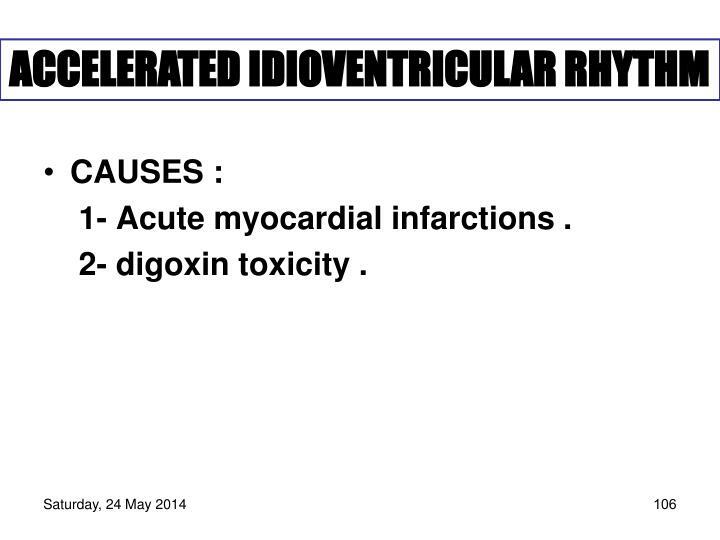 2- inferior myocardial infarction . 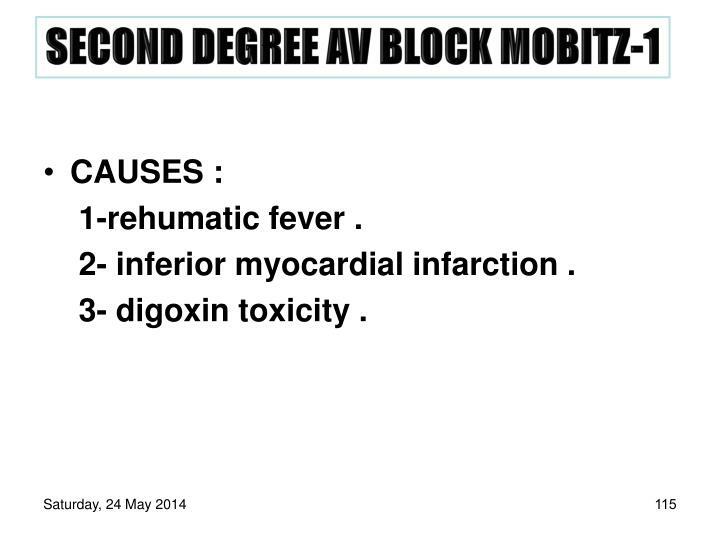 3- valvular heart disease . 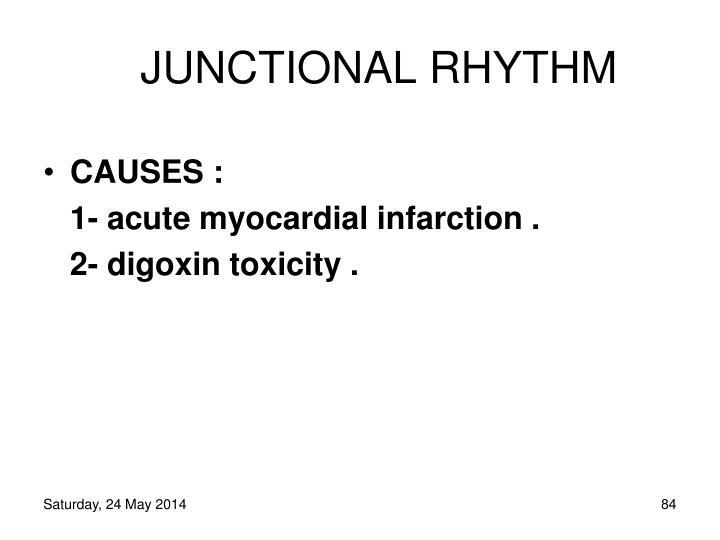 3- inferior myocardial infarction . 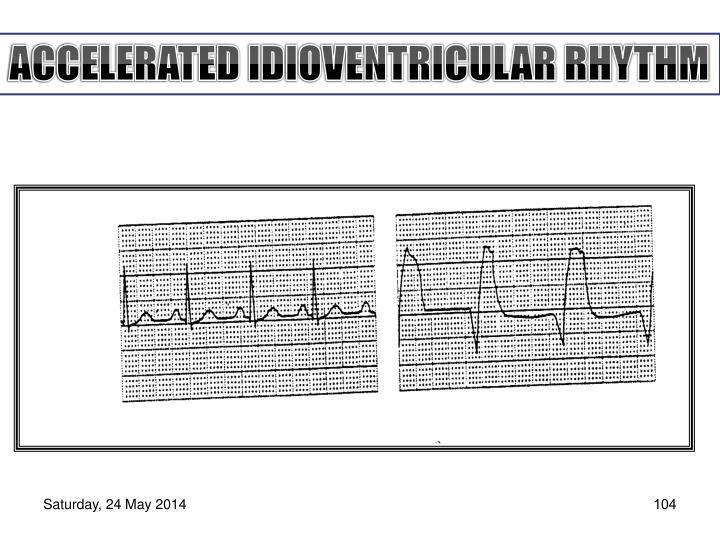 4- anterior myocardial infarction . 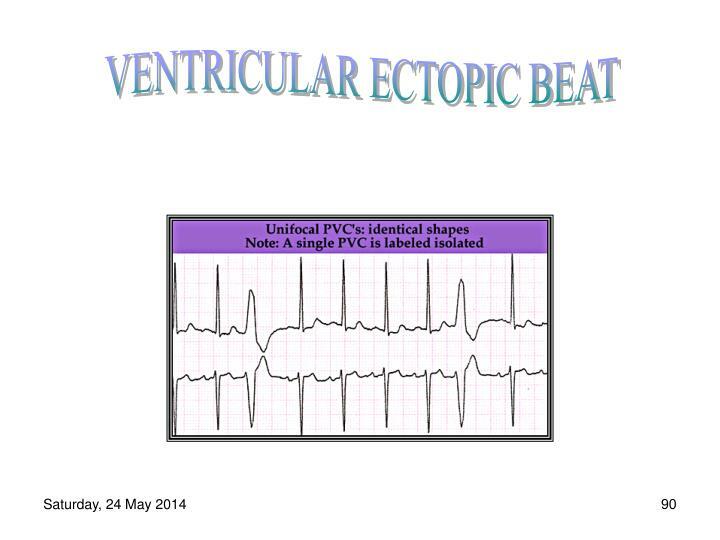 This type occurs when SA node & the atria are unable to discharge an impulse to depolarize both atria & ventricles , therefore an ectopic focus in the surrounding junctional tissue take the responsibility as apace maker at a rate of ( 40-60 ) bpm . 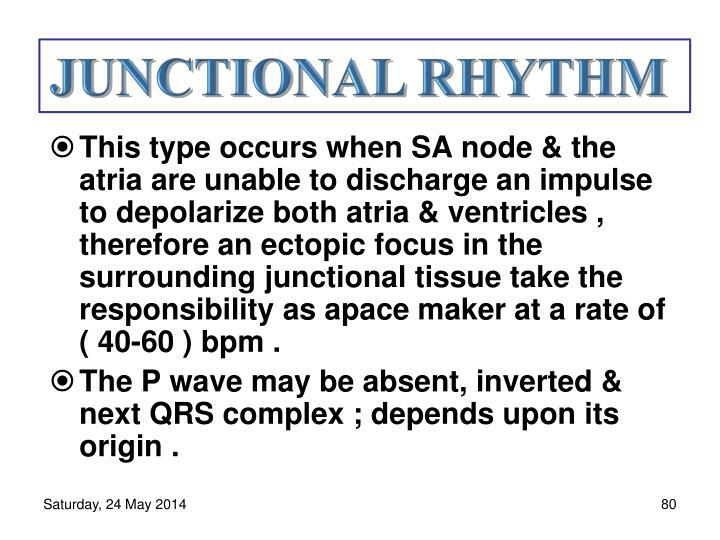 The P wave may be absent, inverted & next QRS complex ; depends upon its origin . 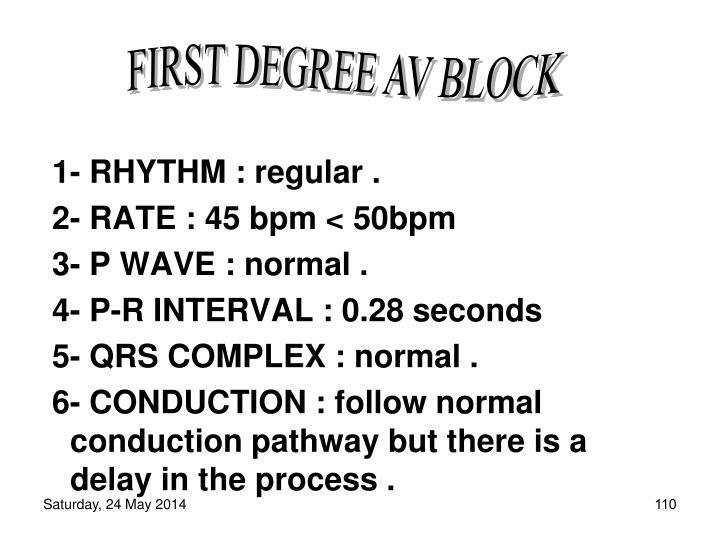 2- RATE : 50 bpm , ( 40 – 60 ) bpm . 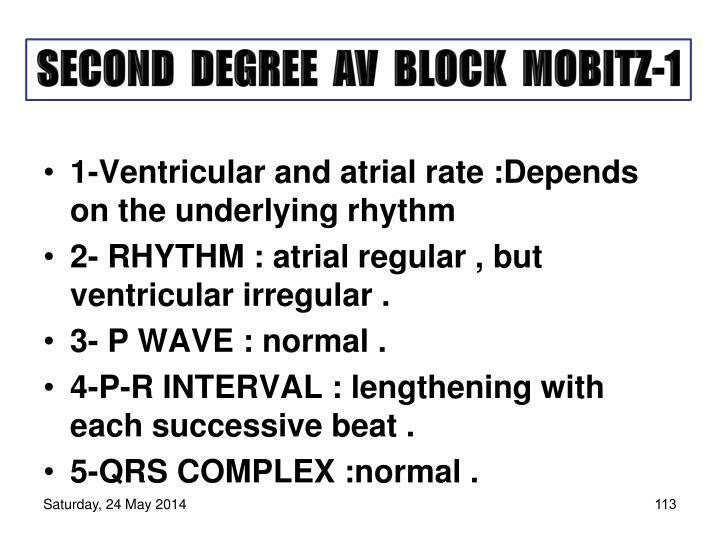 3-P WAVE : Absent . 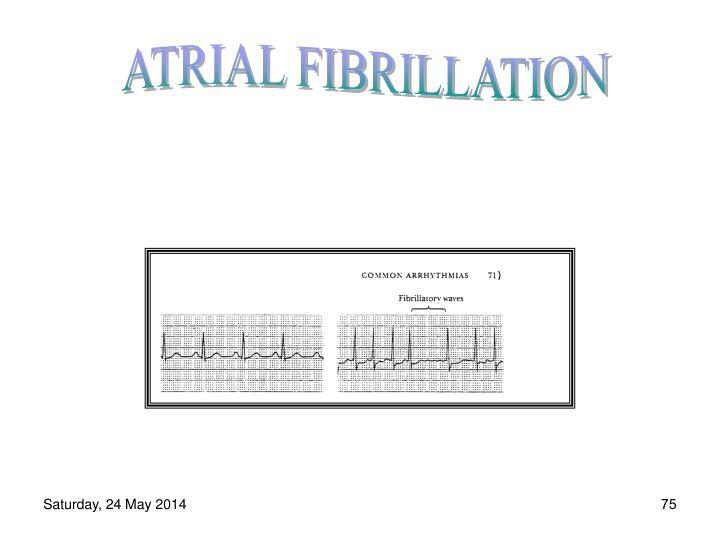 4- QRS COMPLEX : normal configuration & duration . 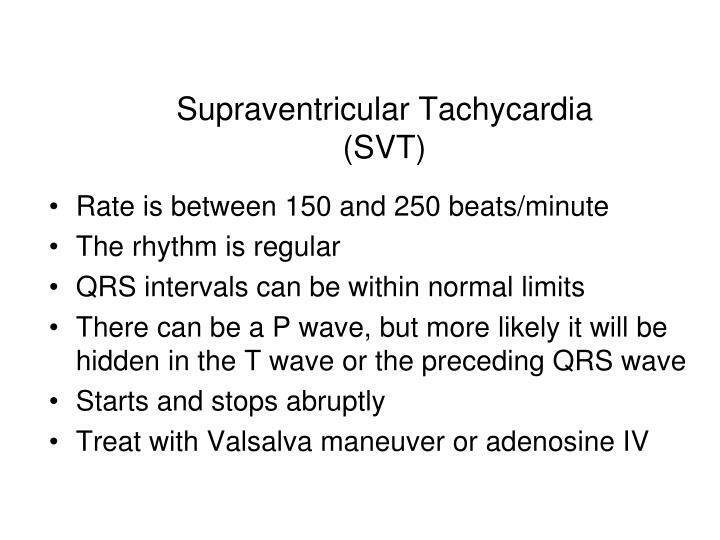 5- T WAVE : normal . 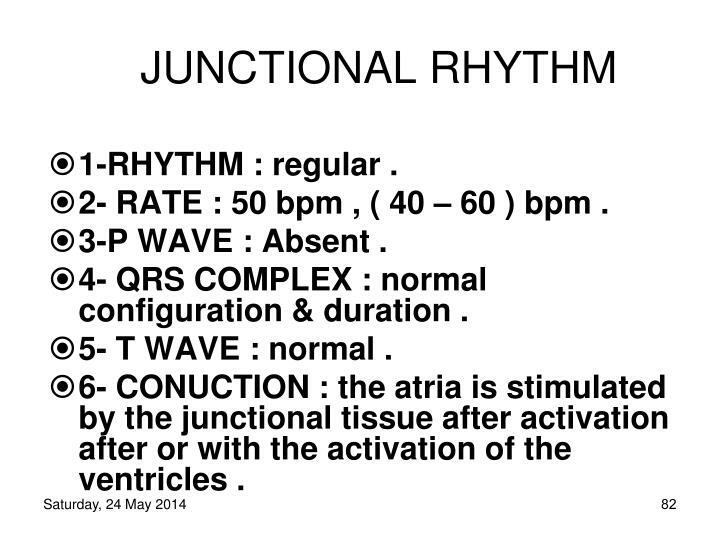 6- CONUCTION : the atria is stimulated by the junctional tissue after activation after or with the activation of the ventricles . 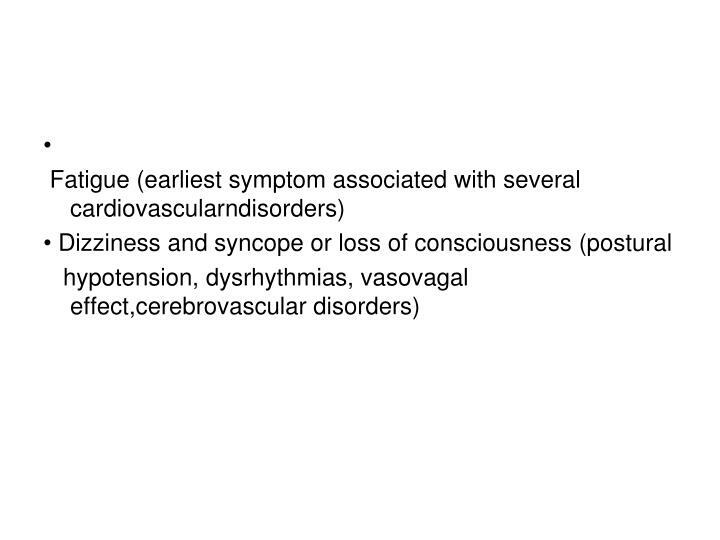 1- acute myocardial infarction . 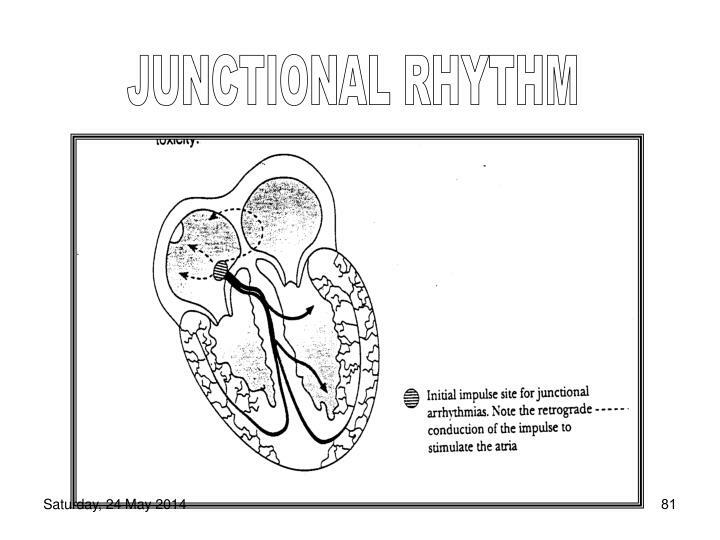 1- RHYTHM : regular . 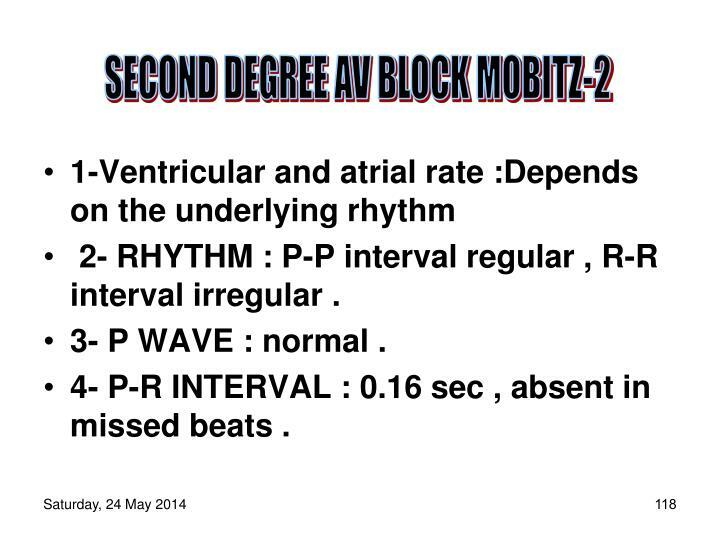 2- RATE : 83 bpm . 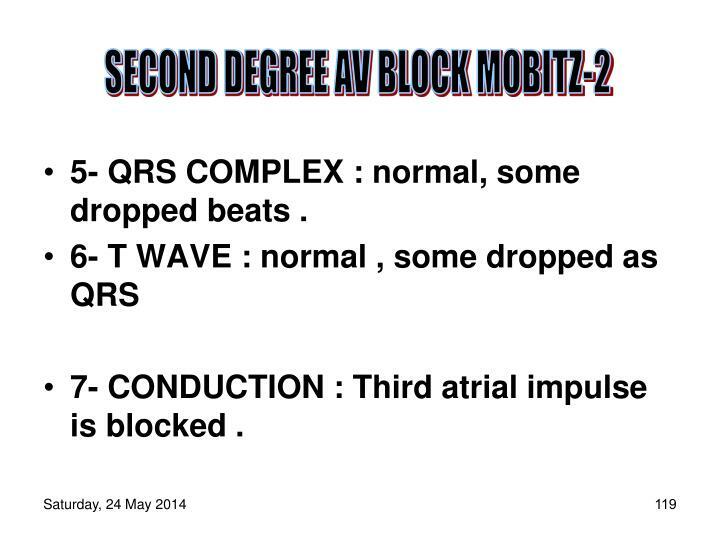 3- P WAVE : after QRS complex . 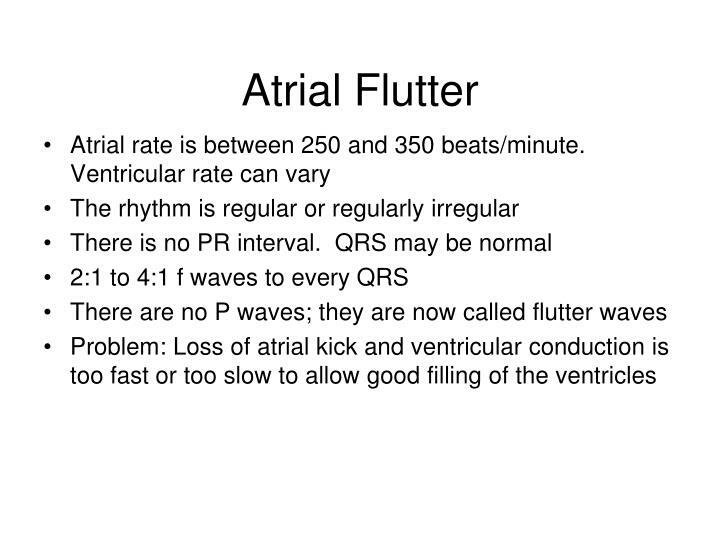 5-T WAVE : Normal . 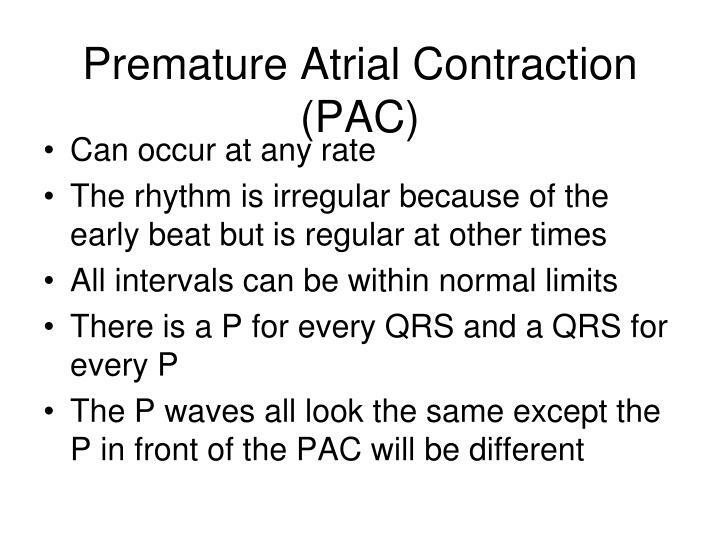 6- CONDUCTION : atria activated after the ventricles so P wave comes after QRS complex . 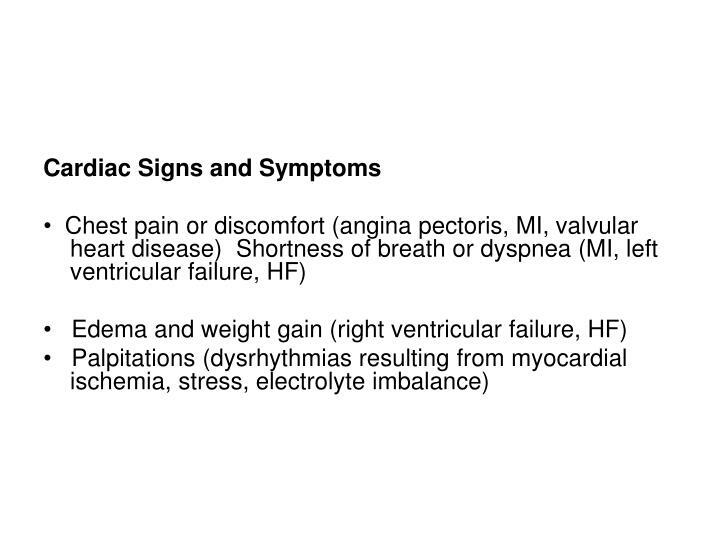 1- congestive heart failure . 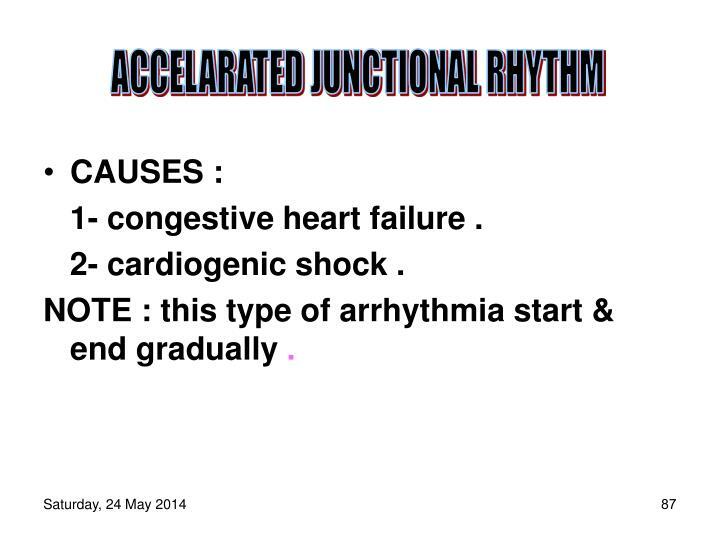 NOTE : this type of arrhythmia start & end gradually . 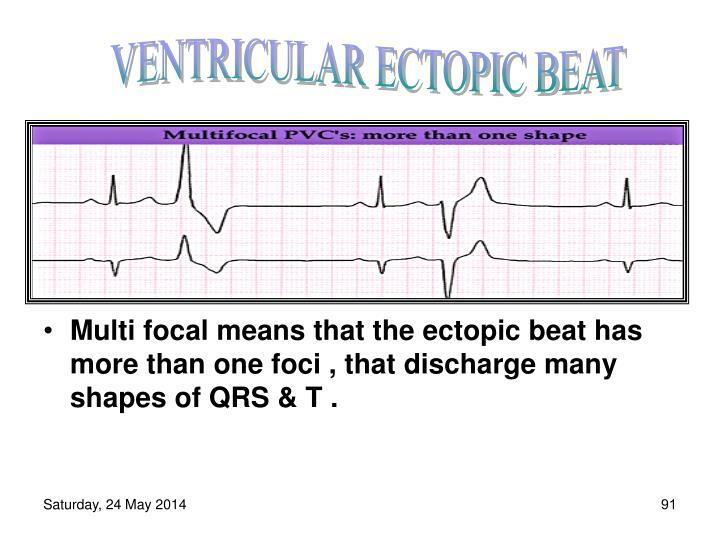 Multi focal means that the ectopic beat has more than one foci , that discharge many shapes of QRS & T .
That means that 2 consequences impulses discharged prior to the next anticipated sinus rhythm impulse . 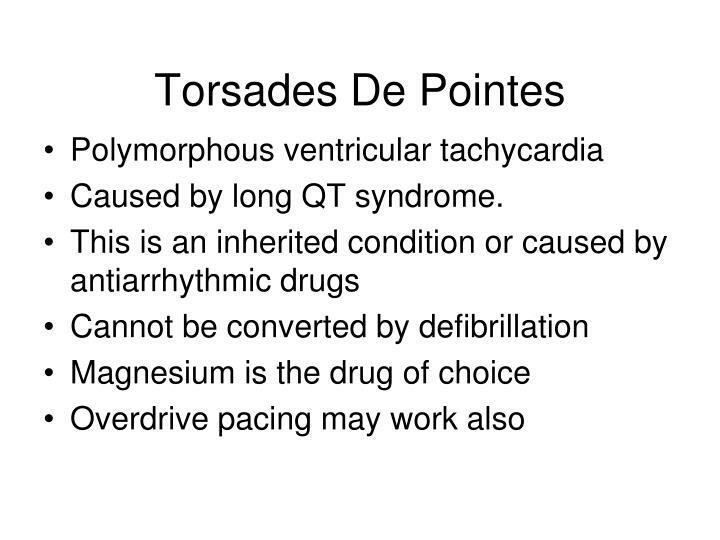 Caused by long QT syndrome. 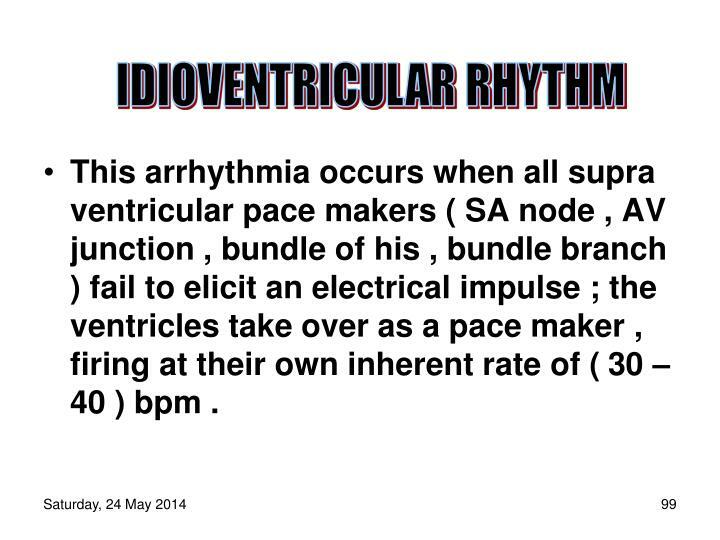 This arrhythmia occurs when all supra ventricular pace makers ( SA node , AV junction , bundle of his , bundle branch ) fail to elicit an electrical impulse ; the ventricles take over as a pace maker , firing at their own inherent rate of ( 30 – 40 ) bpm . 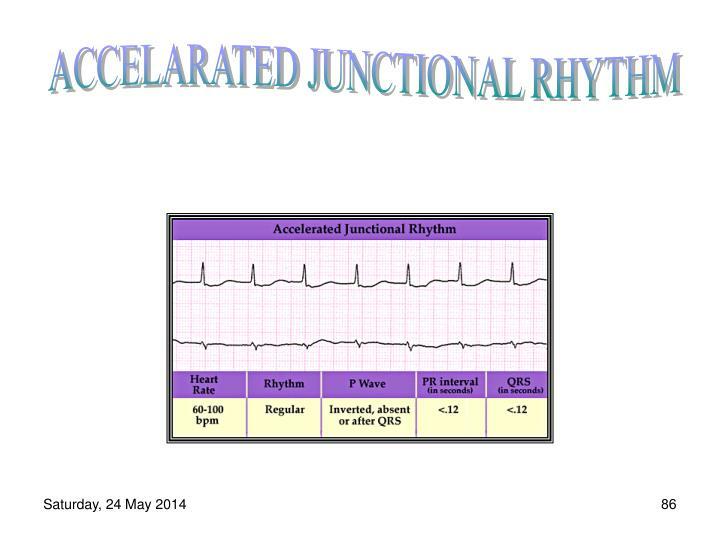 1-RHYTHM : regular R-R interval . 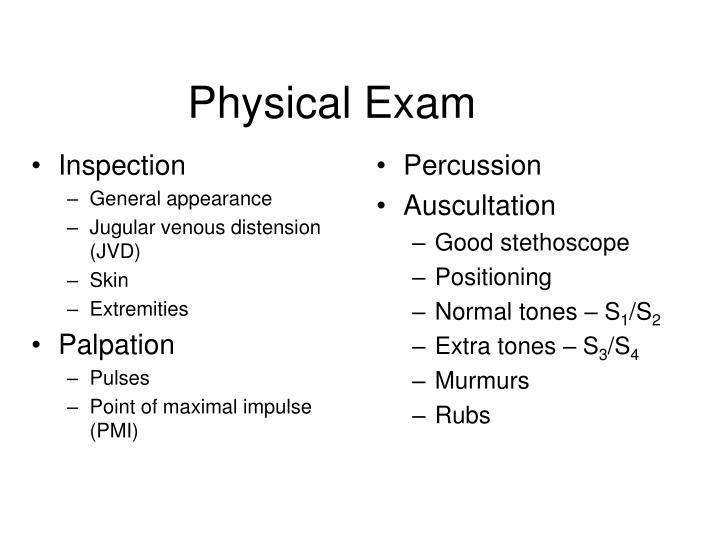 2- RATE :(30-40) bpm . 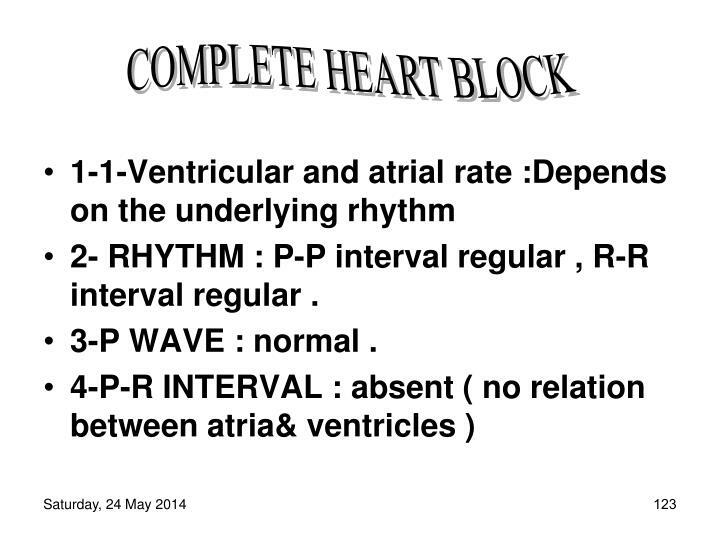 3- P WAVE : absent . 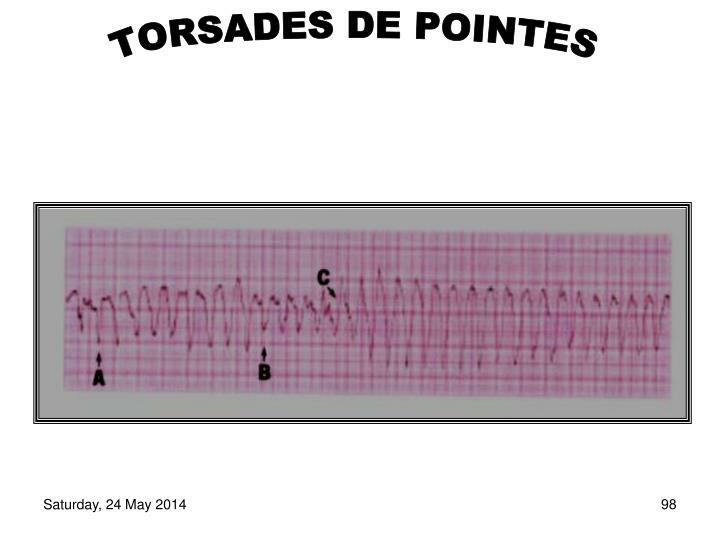 4-QRS COMPLEX : wide & bizarre . 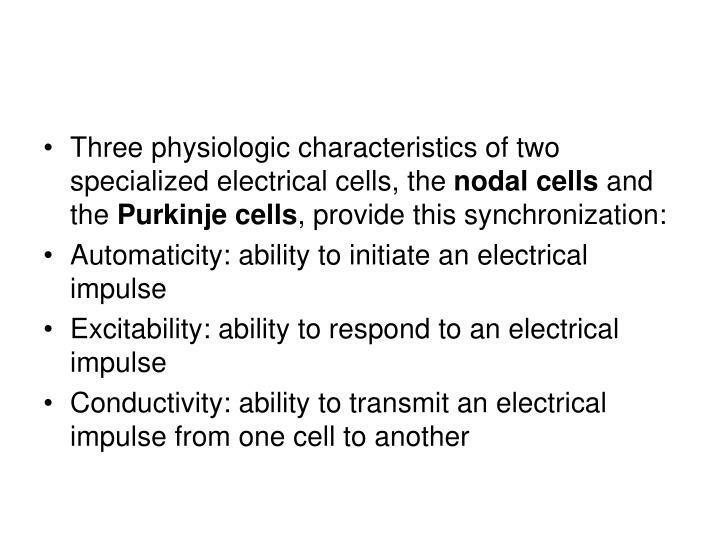 5- CONDUCTION : electrical impulses arises from the purkinji fibers or ventricular myocardium . 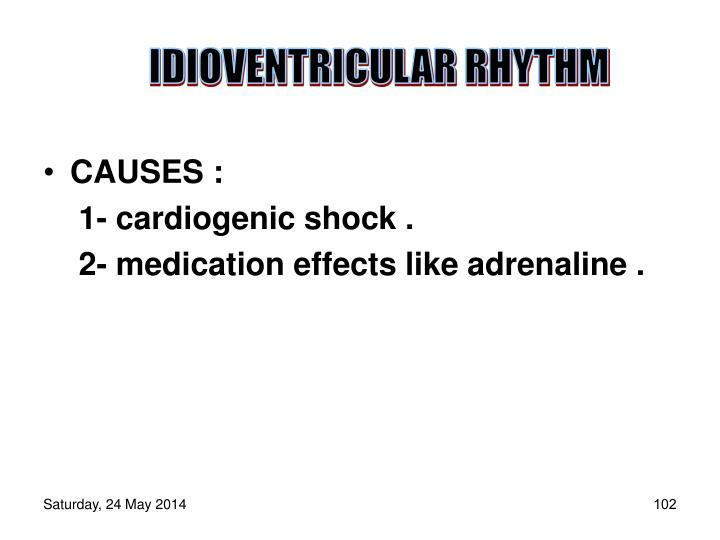 2- medication effects like adrenaline . 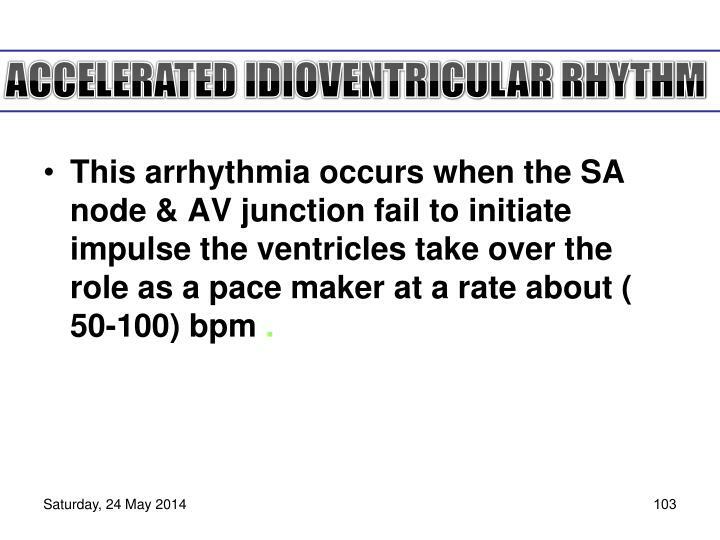 This arrhythmia occurs when the SA node & AV junction fail to initiate impulse the ventricles take over the role as a pace maker at a rate about ( 50-100) bpm . 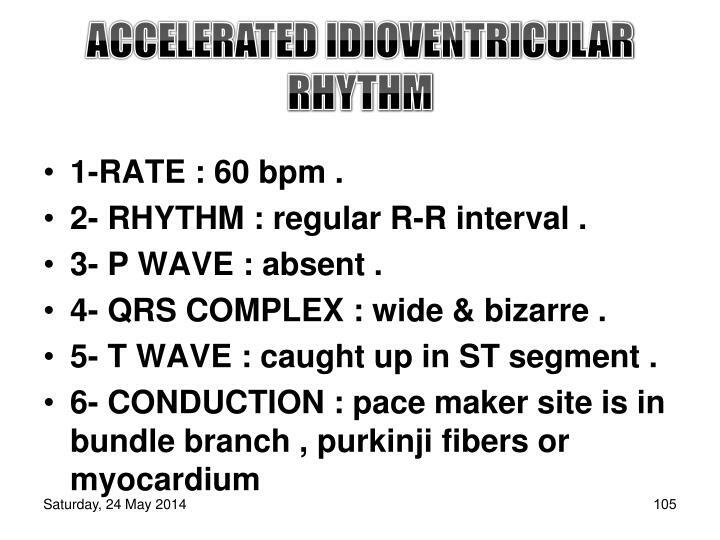 1-RATE : 60 bpm . 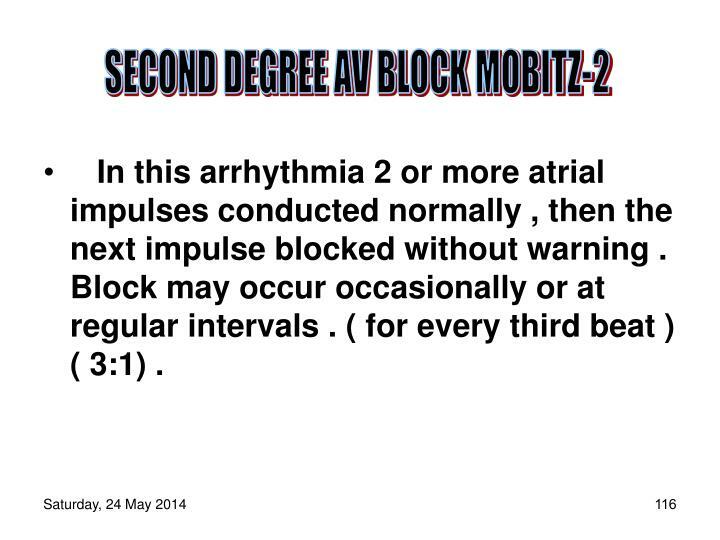 2- RHYTHM : regular R-R interval . 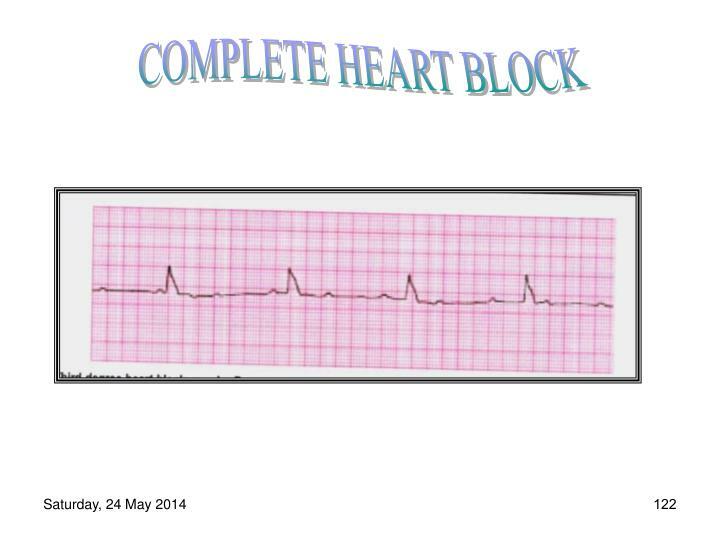 4- QRS COMPLEX : wide & bizarre . 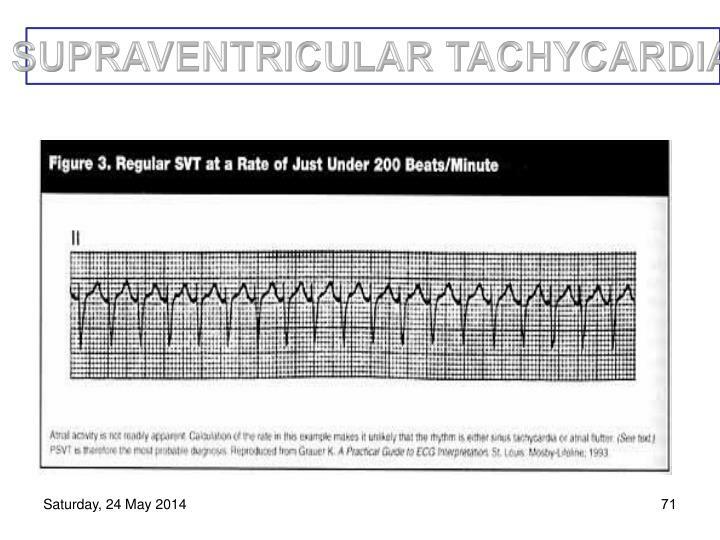 5- T WAVE : caught up in ST segment . 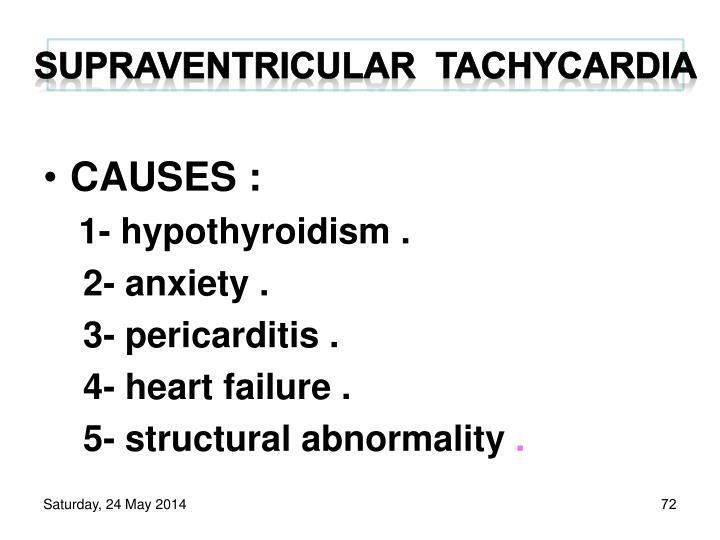 1- Acute myocardial infarctions . 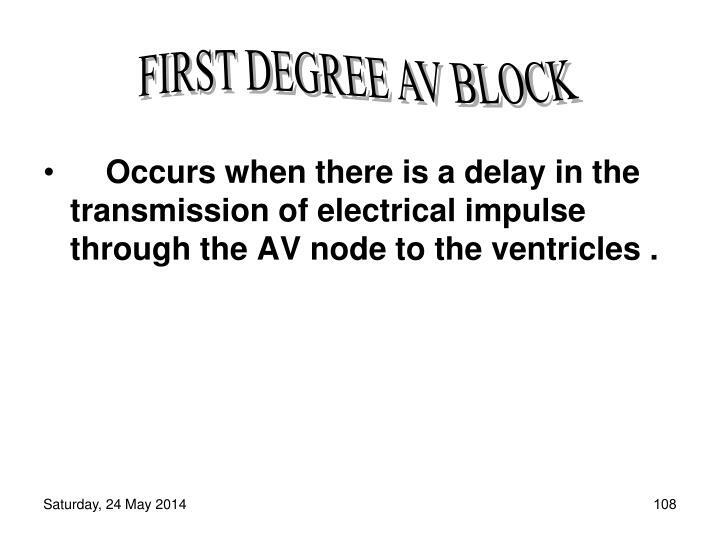 Occurs when there is a delay in the transmission of electrical impulse through the AV node to the ventricles . 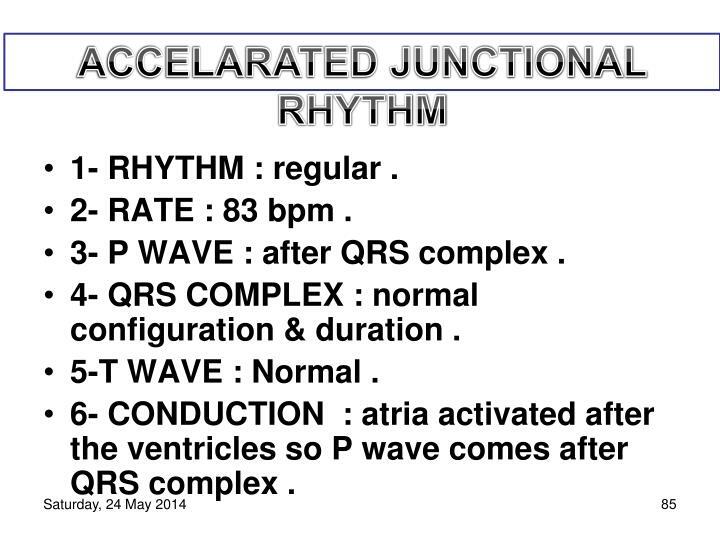 3- P WAVE : normal . 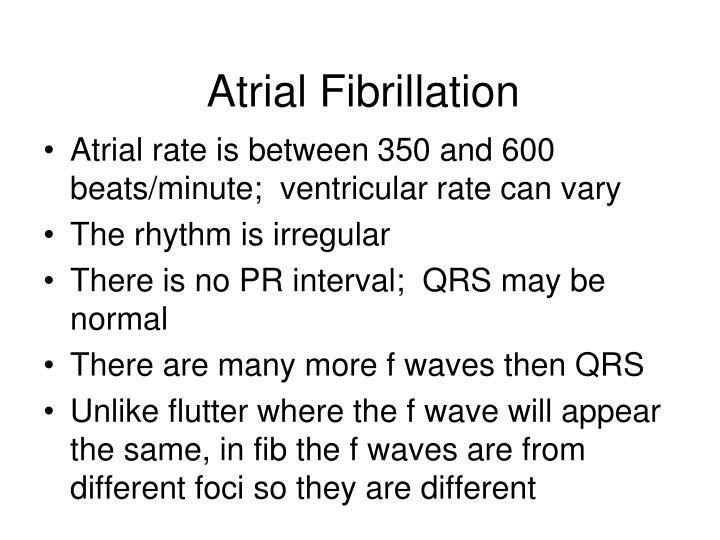 5- QRS COMPLEX : normal . 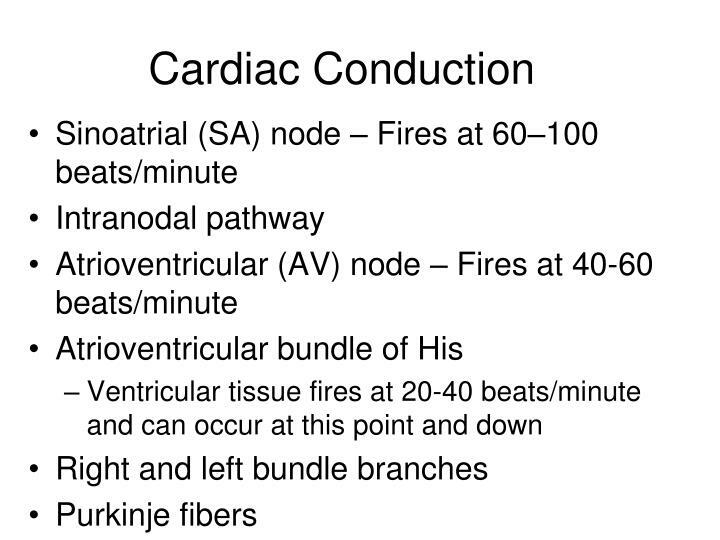 6- CONDUCTION : follow normal conduction pathway but there is a delay in the process . 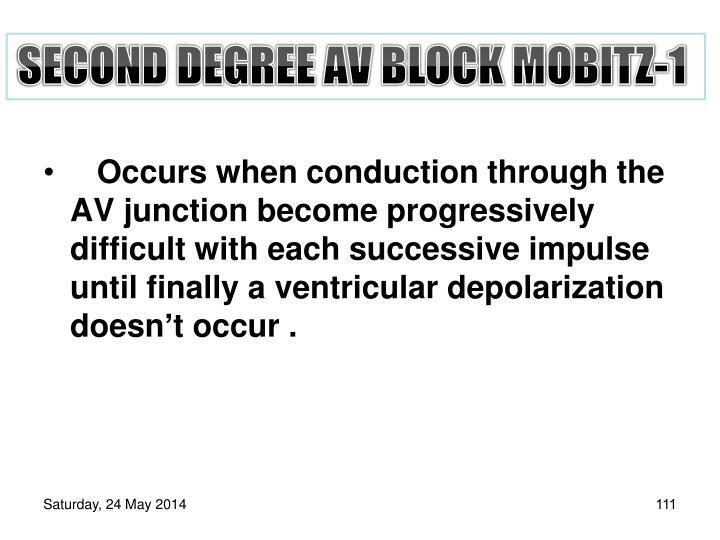 Occurs when conduction through the AV junction become progressively difficult with each successive impulse until finally a ventricular depolarization doesn’t occur . 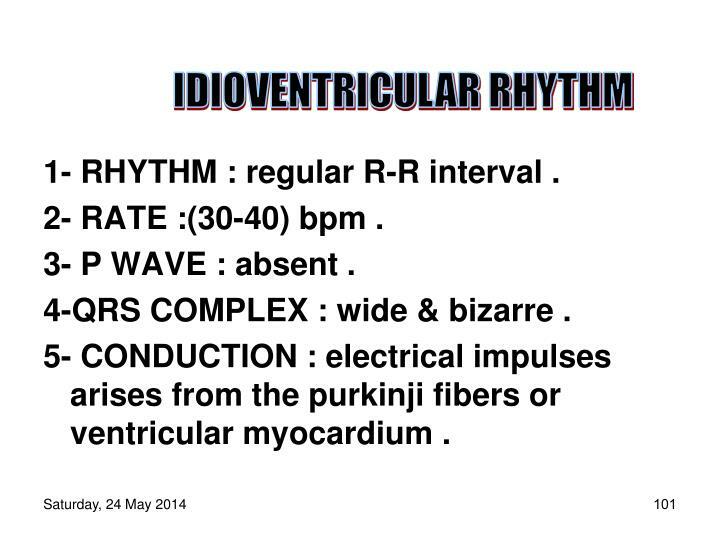 2- RHYTHM : atrial regular , but ventricular irregular . 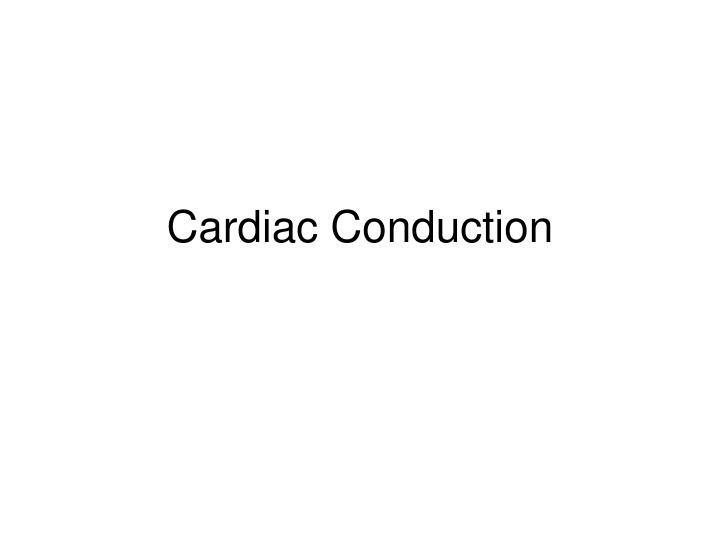 4-P-R INTERVAL : lengthening with each successive beat . 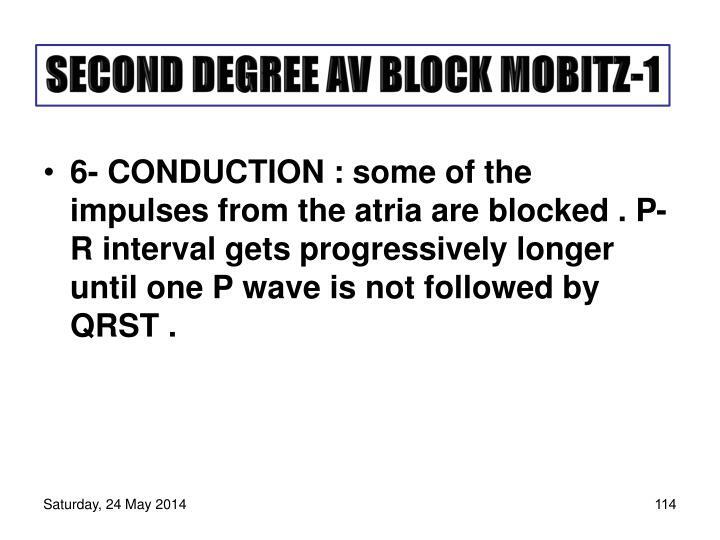 6- CONDUCTION : some of the impulses from the atria are blocked . 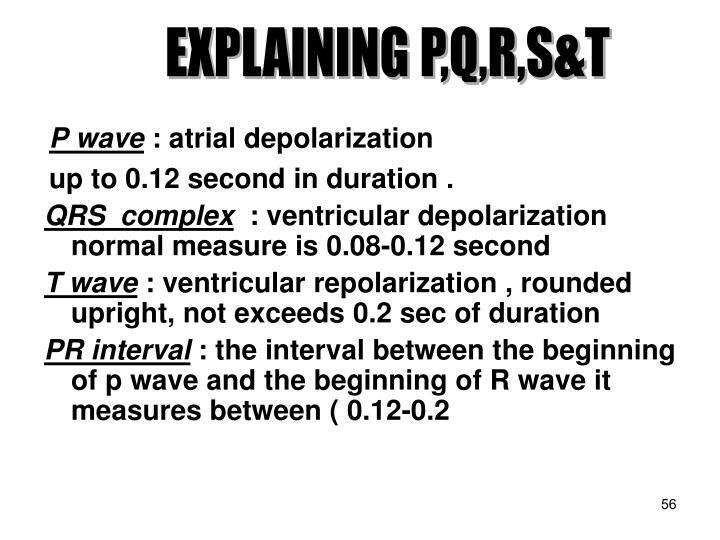 P-R interval gets progressively longer until one P wave is not followed by QRST . 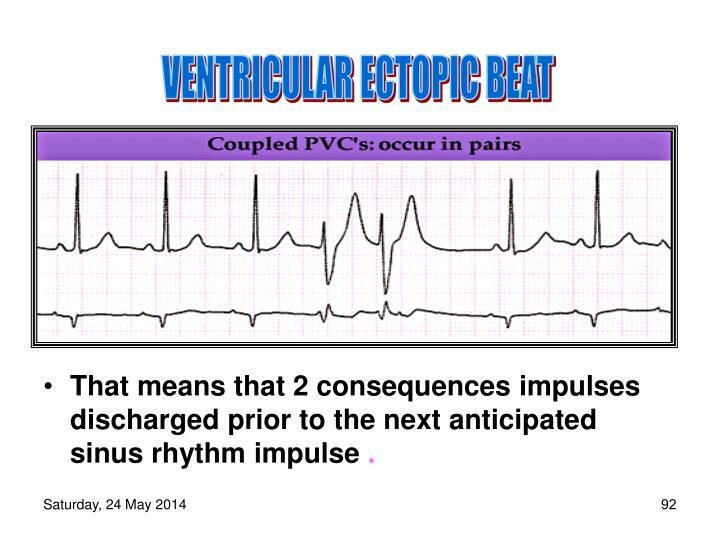 In this arrhythmia 2 or more atrial impulses conducted normally , then the next impulse blocked without warning . 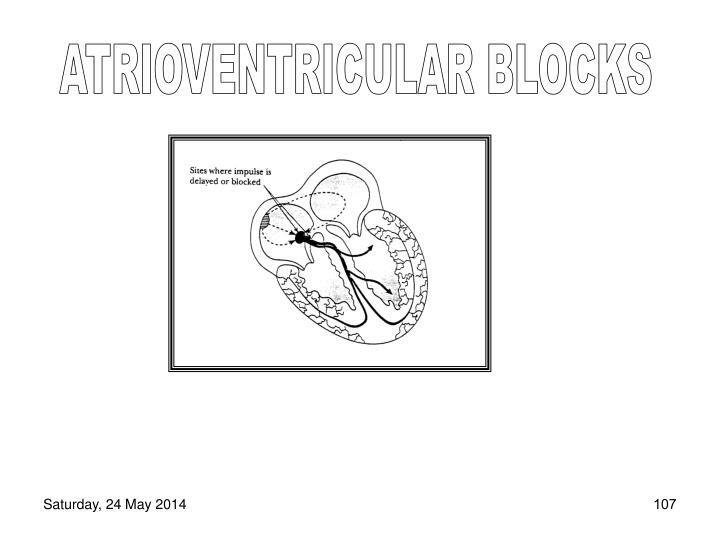 Block may occur occasionally or at regular intervals . ( for every third beat ) ( 3:1) . 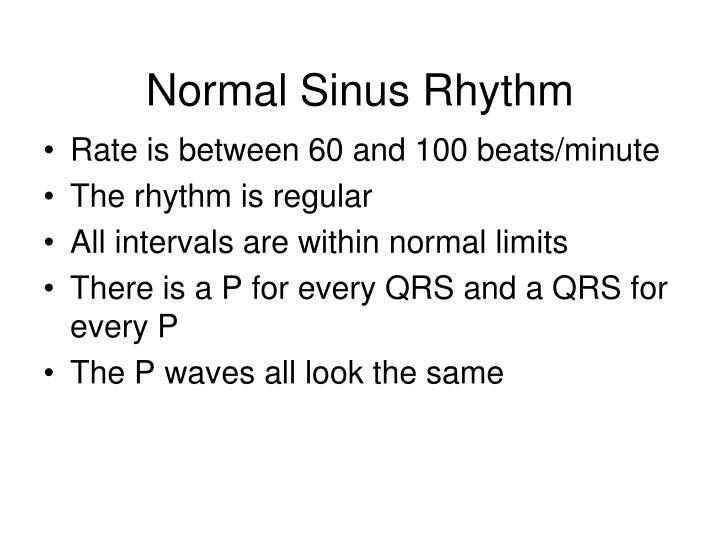 2- RHYTHM : P-P interval regular , R-R interval irregular . 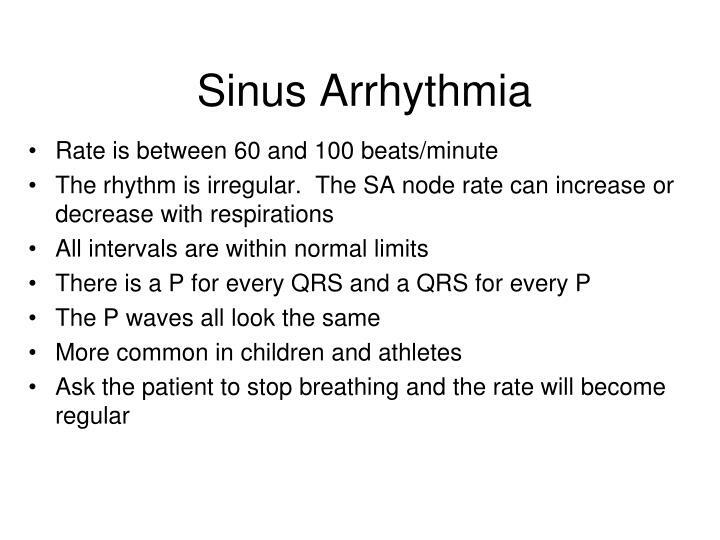 4- P-R INTERVAL : 0.16 sec , absent in missed beats . 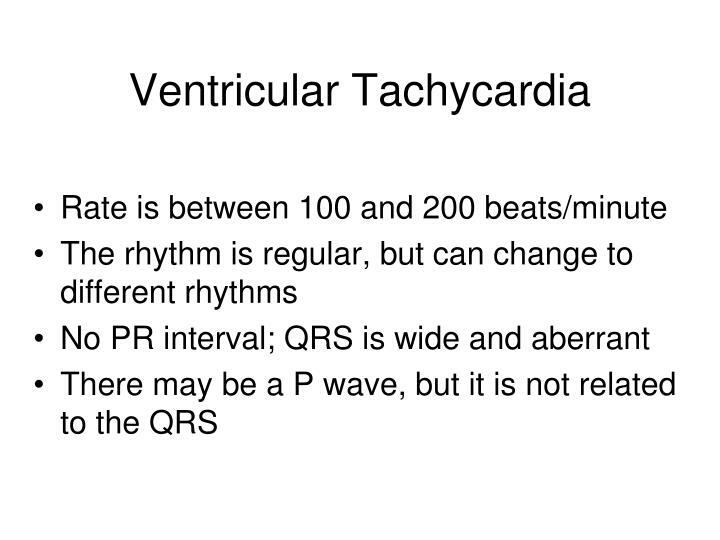 5- QRS COMPLEX : normal, some dropped beats . 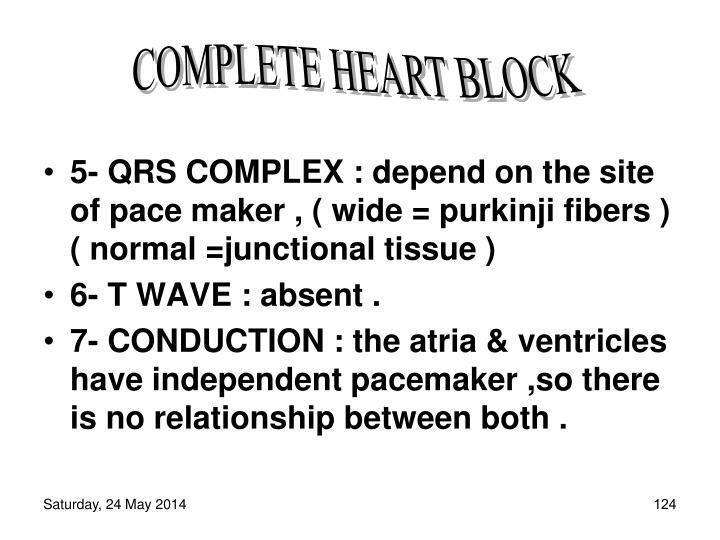 7- CONDUCTION : Third atrial impulse is blocked . 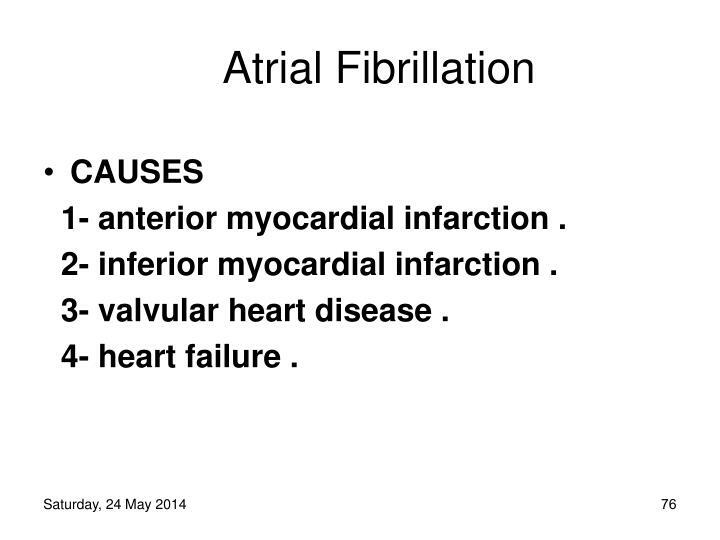 2- anterior myocardial infarction . 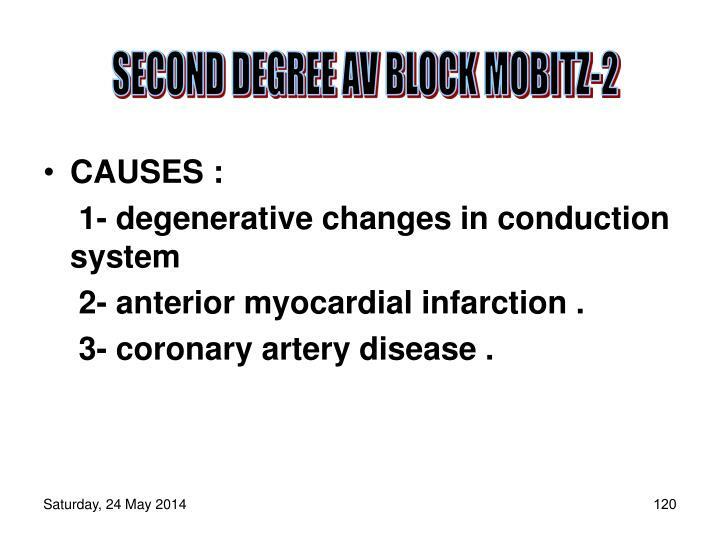 3- coronary artery disease . 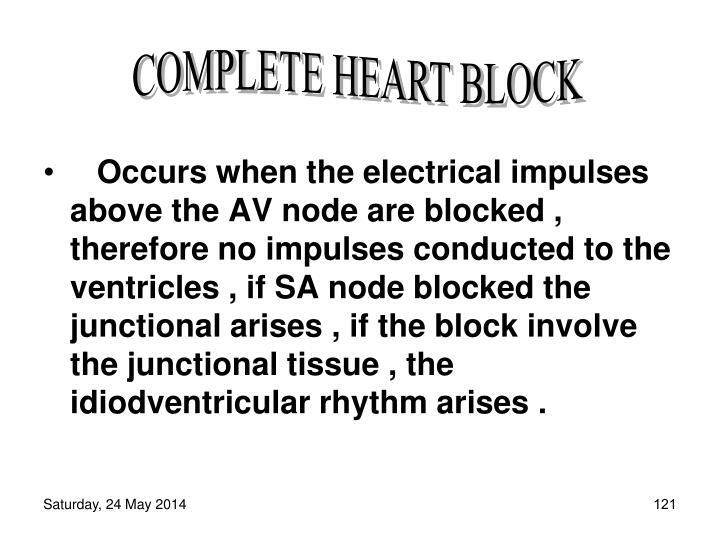 Occurs when the electrical impulses above the AV node are blocked , therefore no impulses conducted to the ventricles , if SA node blocked the junctional arises , if the block involve the junctional tissue , the idiodventricular rhythm arises . 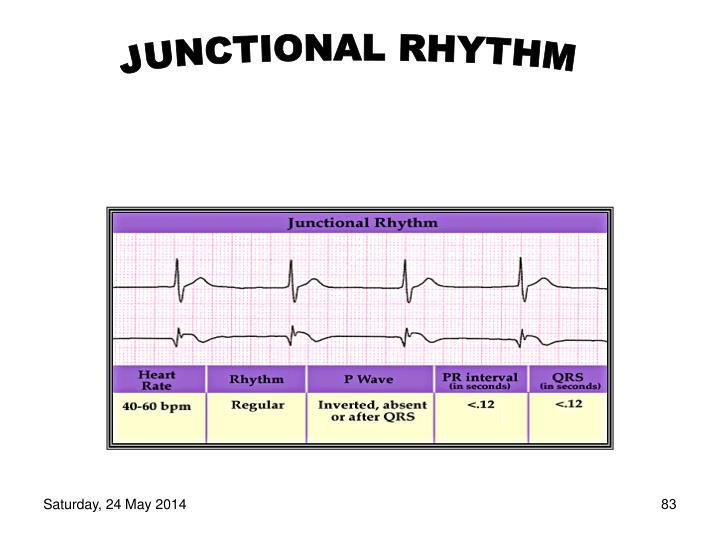 2- RHYTHM : P-P interval regular , R-R interval regular . 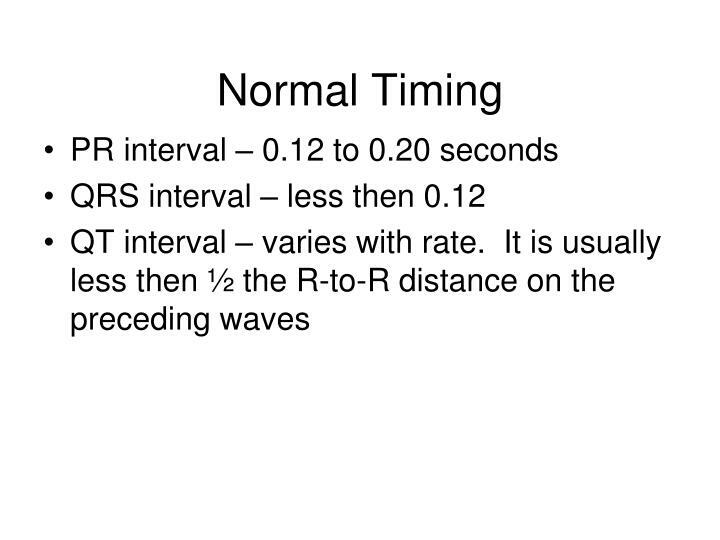 3-P WAVE : normal . 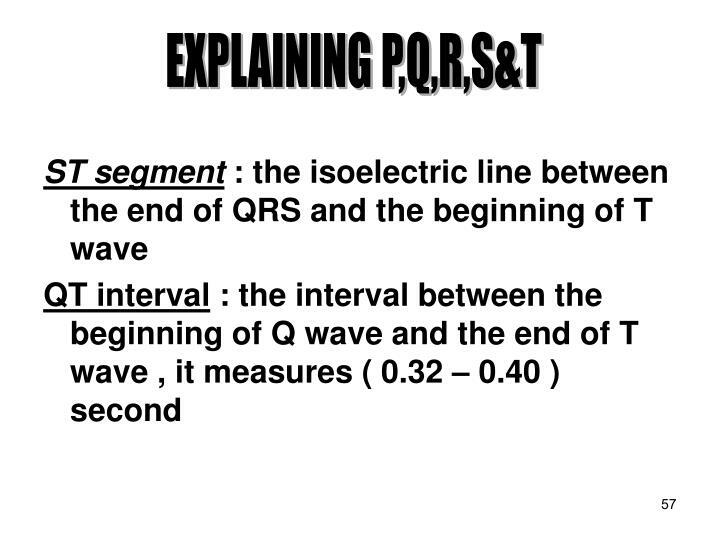 6- T WAVE : absent . 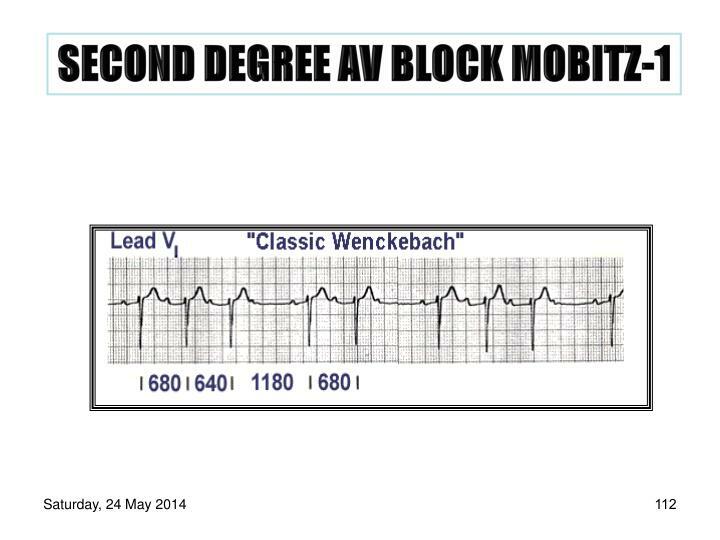 7- CONDUCTION : the atria & ventricles have independent pacemaker ,so there is no relationship between both . 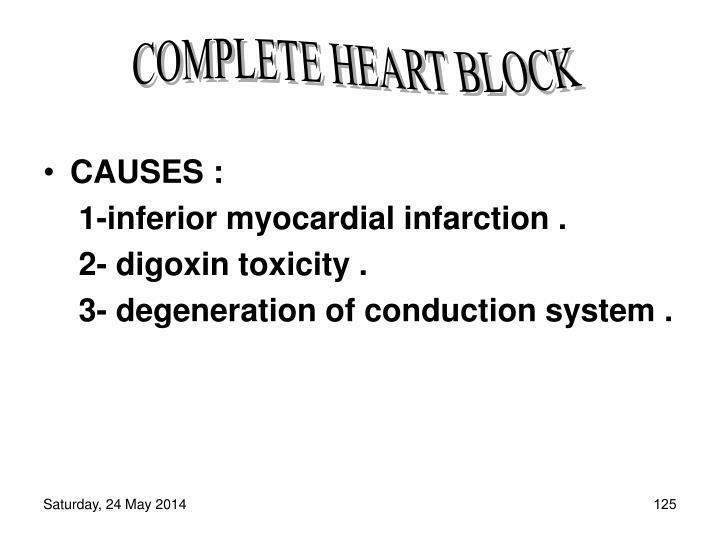 3- degeneration of conduction system . 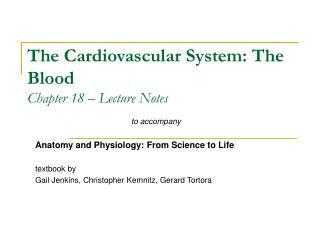 Anatomy of the Cardiovascular System -. 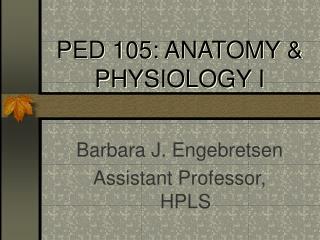 anatomy &amp; physiology. heart song. 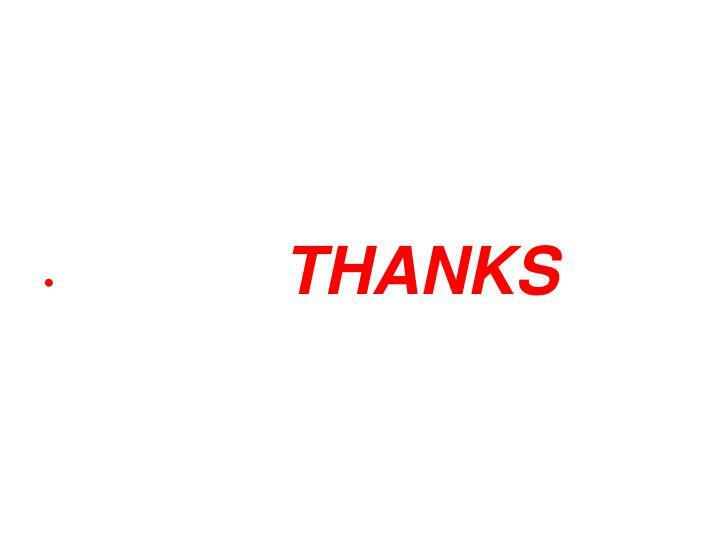 http://www.youtube.com/watch?v=q0s-1mc1hce. 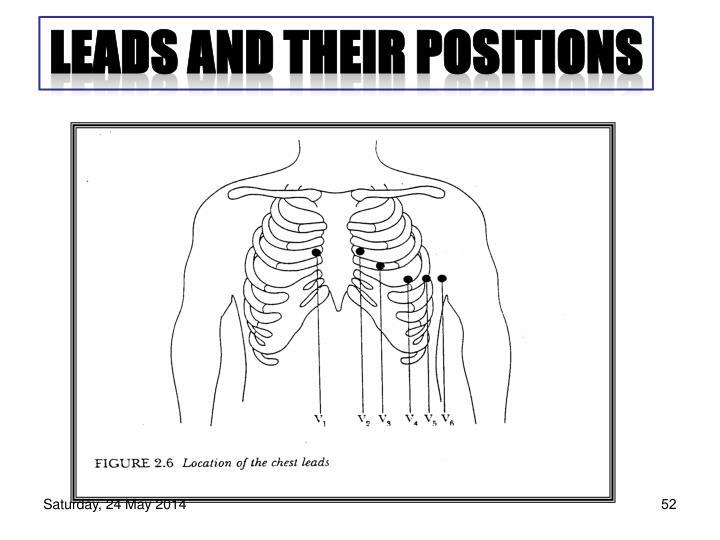 location of the heart. 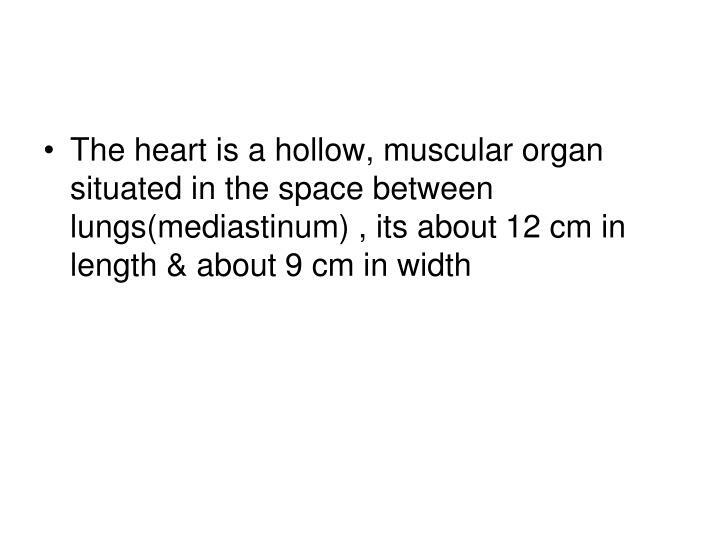 in mediastinum behind the sternum between 2 nd &amp; 6 th ribs. 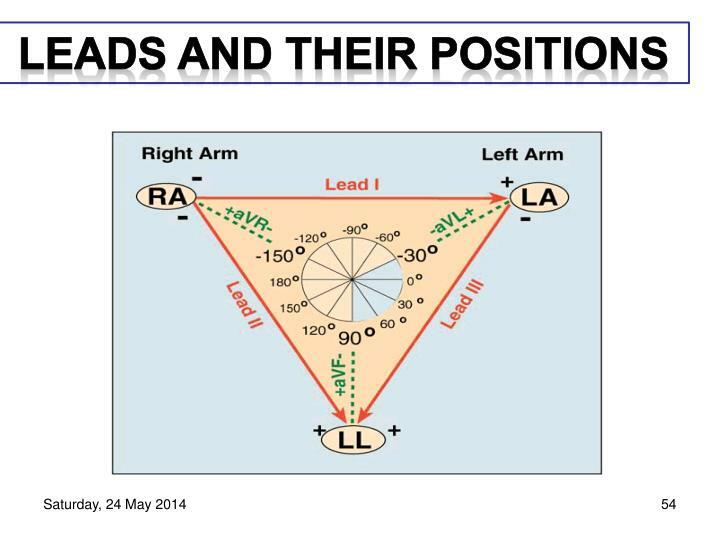 shifted to left. 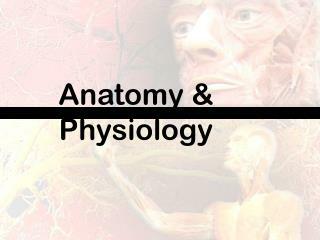 Anatomy & Physiology -Anatomy &amp; physiology. 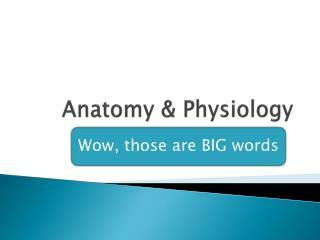 wow, those are big words. 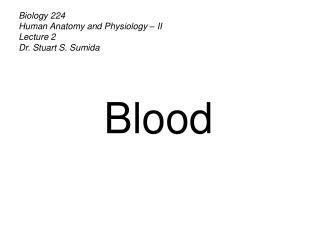 anatomy. 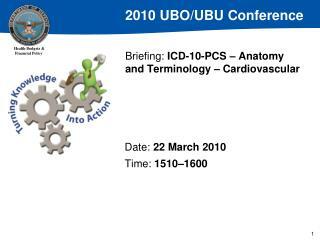 the art of dissecting, or artificially separating the different parts of any organized body, to discover their location, structure, and meaning. 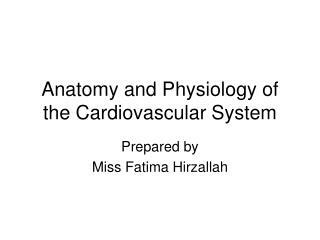 CARDIOVASCULAR SYSTEM -. 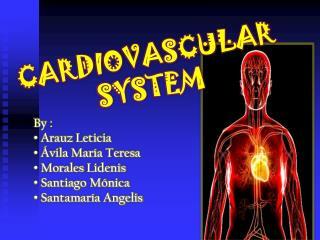 by : arauz leticia Ávila maría teresa morales lidenis santiago mónica santamaría angelis . 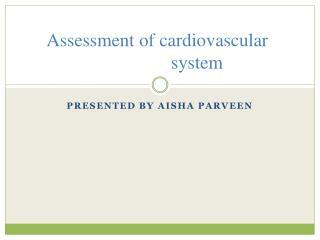 definition of cardiovascular system . 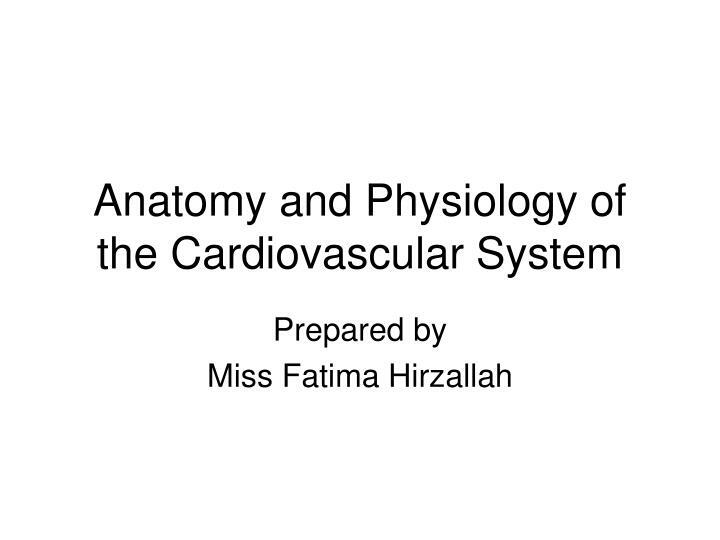 components of cardiovascular system . 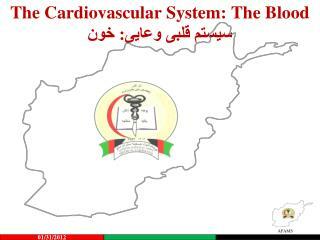 physiology of this system. 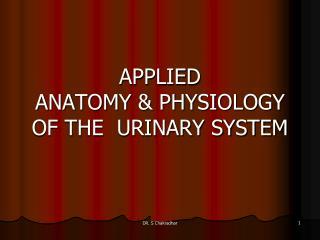 Introduction to Anatomy and Physiology -Overview. 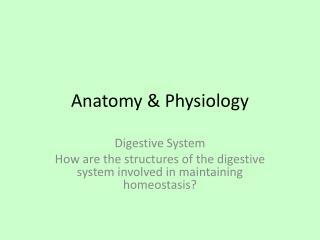 what is anatomy and physiology?basic functions of living thingslevel of structural organizationhomeostasisnegative feedbackpositive feedback. 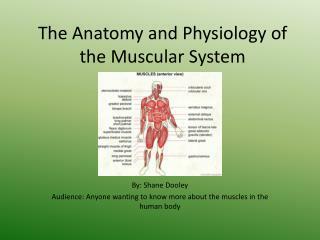 anatomy and physiology .